Thanks for clicking in for another trip report. 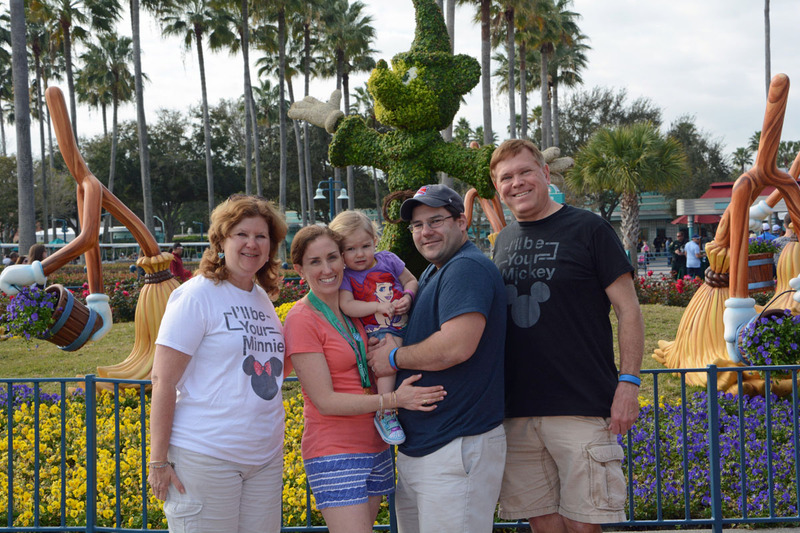 This trip included my wife and I, along with our nephew Tim, his wife Marissa (the marathon runner) and their little princess, Maddie. 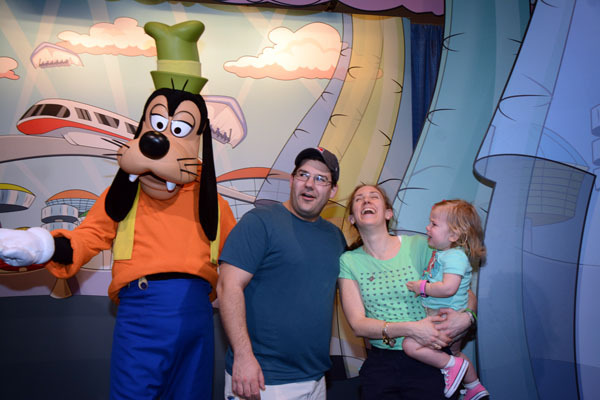 Sorry for the details, but they can help others in planning their vacation to Walt Disney World; from timing, preferences to costs. We woke up very early (one of the themes for this trip) at 2:50 AM to be picked up by our brother-in-law Rich at 3:45 to meet up with Tim. Marissa and Maddie. We left for JFK airport at 4:08 AM for our 6 AM flight. After printing out our boarding passes we discovered that Kelli and I had TSA Precheck. We could use the shorter line but that meant we could not help Tim and Marissa get through the security queue. It took them a good 20 minutes to get through. Fortunately our gate was very close. Our Jet Blue did not have a “blue” name as it had the I Love NY overlay. We had rows 7 and 8. We pushed back on time and Maddie was very good on the plane. Maddie spent some time on Kelli’s lap and the fold down tray looking out the window. We landed at 8:37. We had to pick up one piece of checked luggage not being delivered by DME at side A of the terminal, then travel over to side B for Disney Magical Express. We stopped in the rest rooms to change into cooler clothing. We got to DME at 9:20, checked in with our Magic Bands and were on the bus at 9:32. We left the airport at 9:45 and arrived at the first stop, Art of Animation at 10:10 AM. 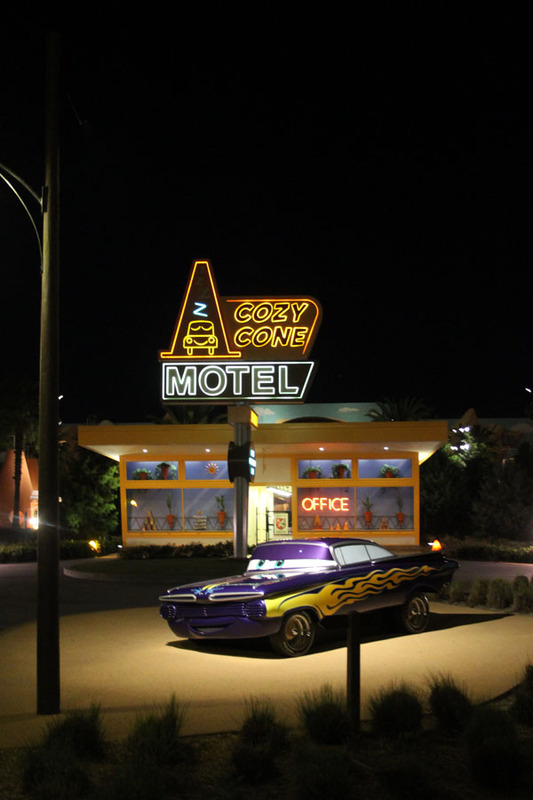 The bus was continuing on to Pop Century. Plane to resort time: 1 hour, 33 minutes, about average. We checked in and had suite 3721 in the Cars section. But when we arrived our Magic Bands would not open our room. Tim headed back down to registration. 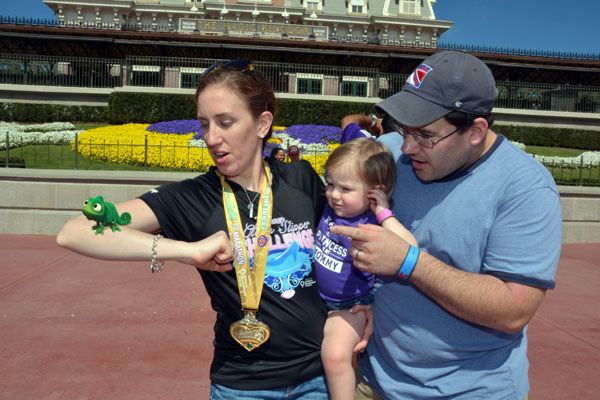 He called a little later and Marissa had to run all of our Magic Bands down to check in. 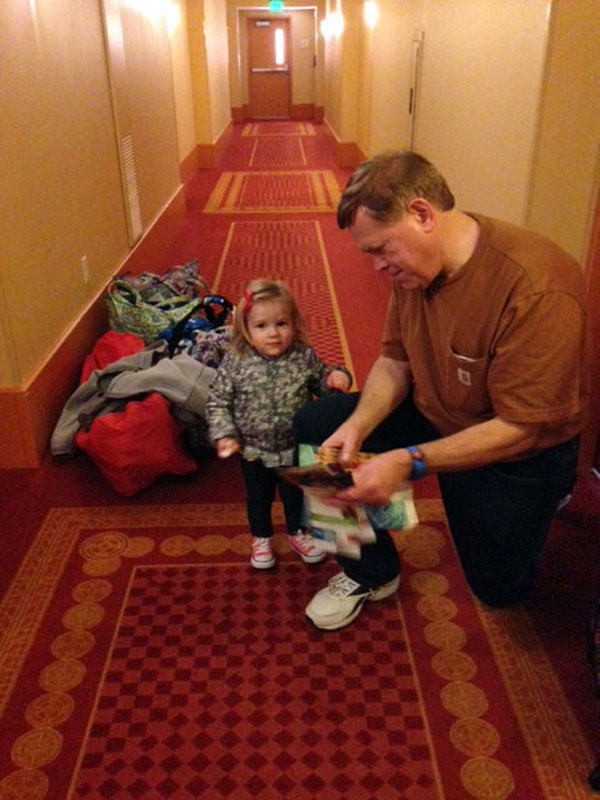 Kelli and I had fun with Maddie running and exploring the hallway. When they returned the bands worked flawlessly after that little hiccup. 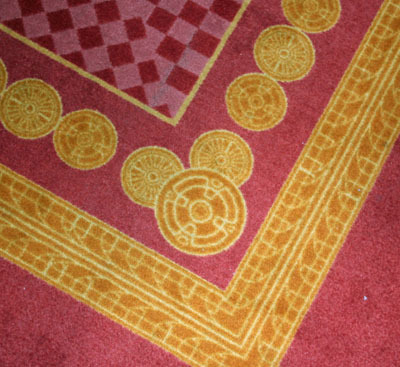 We found a couple of hidden Mickeys in the carpeting and a tabletop depicting a map of Cars Land. 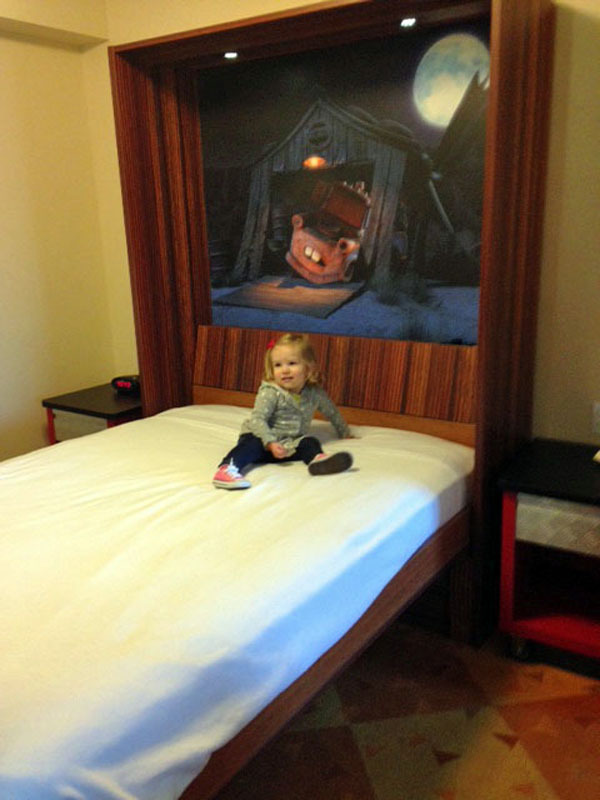 Maddie loved the room and ran all around. She even tried out the phone. Our luggage arrived shortly and we unpacked. 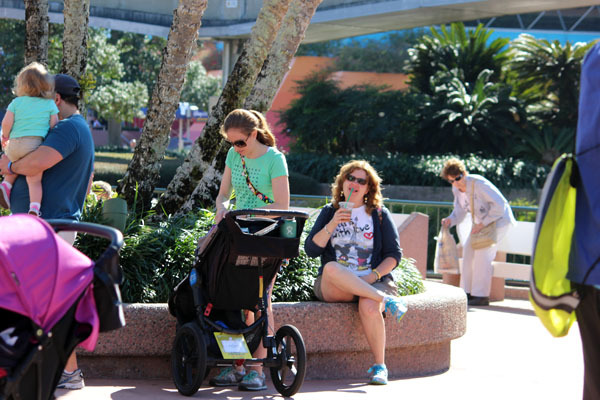 We headed to Epcot and were waiting for the bus by 11:30. 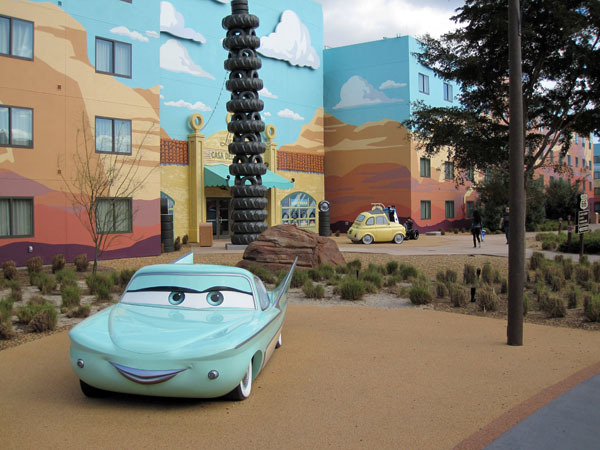 One thing different about Art of Animation over Pop Century; the bus stops have some shade. We saw the two new solar panel fields along the way just outside Epcot. One of them forms a classic Mickey as seen from the air. Marissa was selected for the new metal detectors at security. 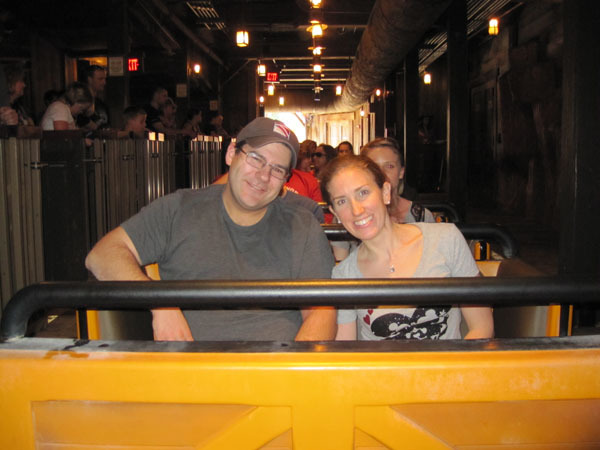 Tim and Marissa had to stop at Guest Relations to pick up their Annual Passes using their voucher and get a refund on Memory Maker. 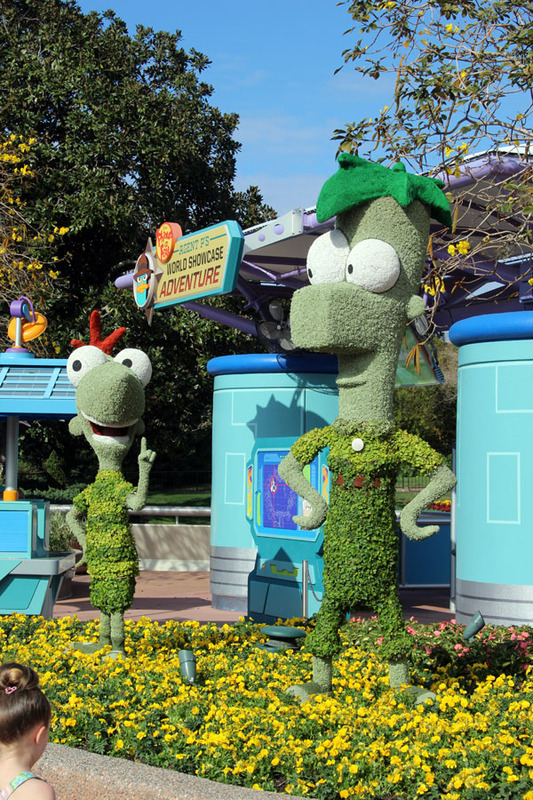 They had paid for it, but it is now included on the new Platinum Annual Passes. 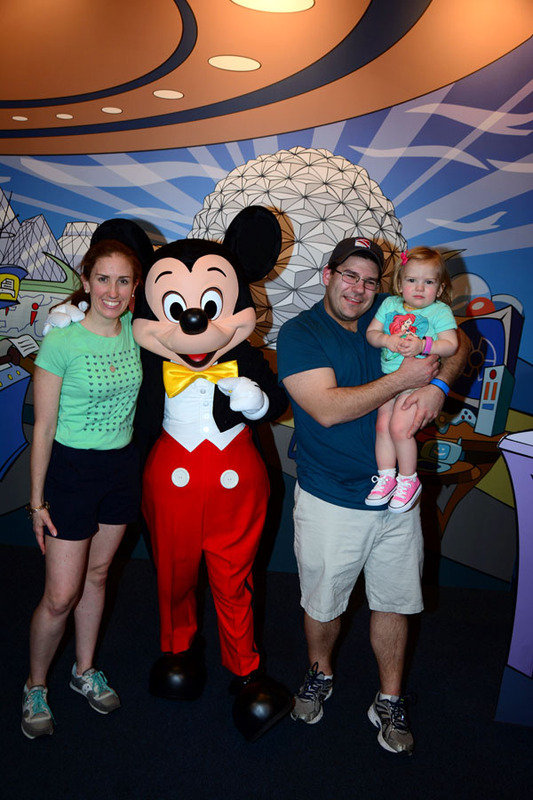 We took a few photos in front of Spaceship Earth. 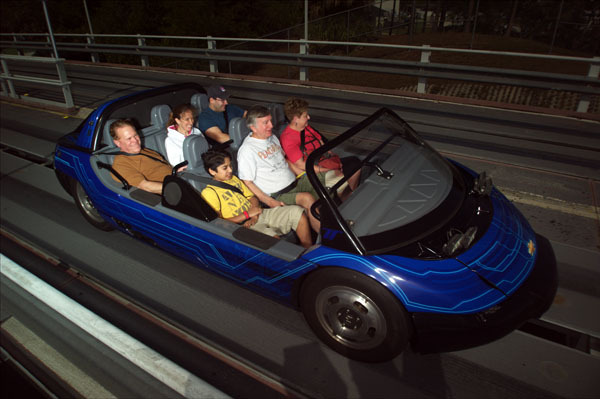 Then it was on to Test Track where we used our first FastPass. Kelli watched Maddie as the three of us enjoyed the ride. Kelli and Maddie were entertained by the Jaminators as we rode. 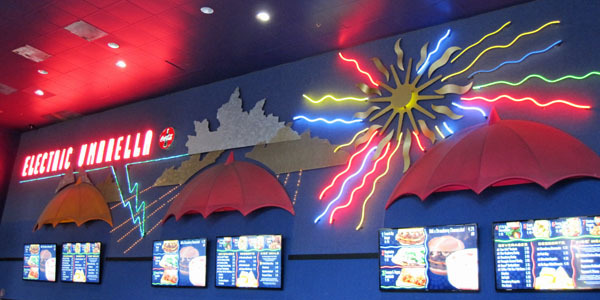 Everyone was hungry so we stopped for lunch at the Electric Umbrella. 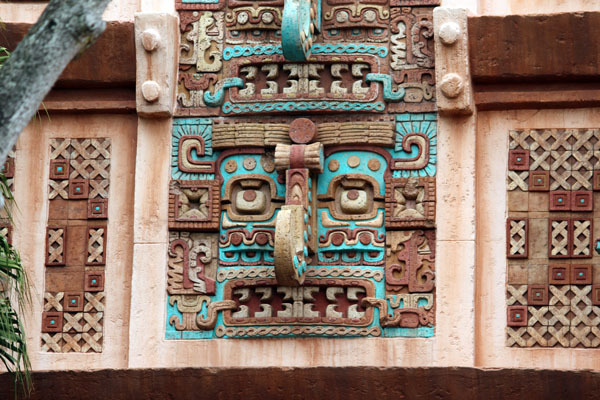 Then it was on to Spaceship Earth using out second Fast Pass Plus. We stopped at Pin Central to look for AP and DVC pins. I picked up a 2015 Food and Wine pin since it featured the Swedish Chef from the Muppets. Caffeine was needed so we stopped at Fountain View (Starbucks). We also tried the Caramel Apple-pie Cupcake as we enjoyed our iced coffees. 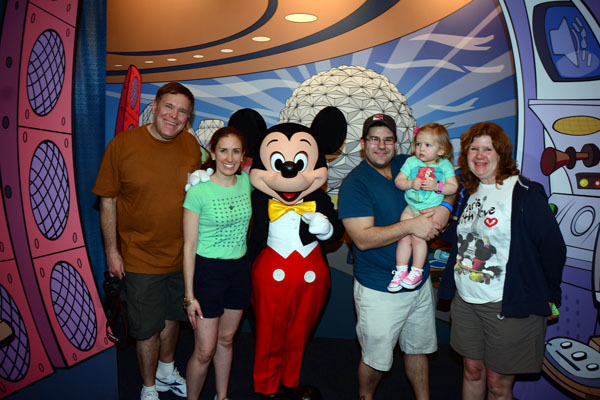 We had time so we waited on the regular line to meet with Mickey and friends. 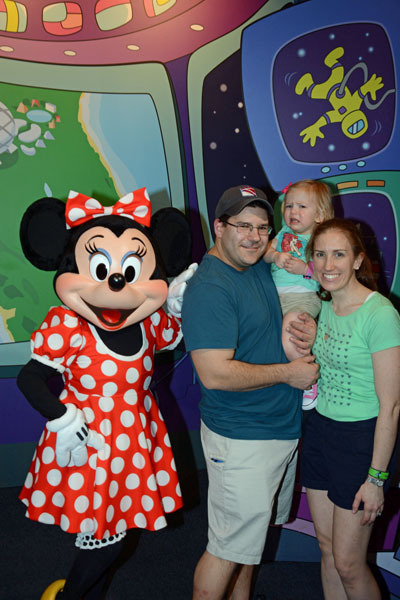 Maddie knows all the characters but we were not sure how she’d react to the larger live ones. She did not do well when she met Santa at Christmas. 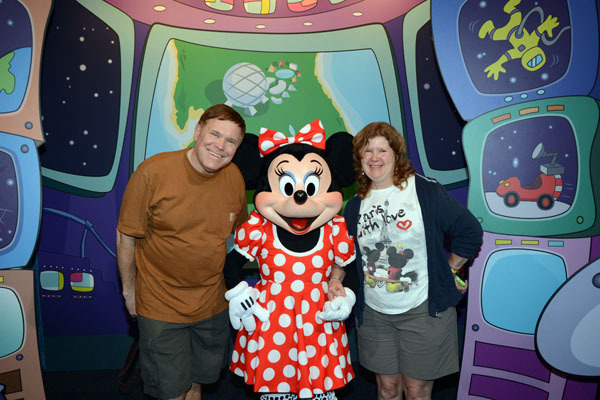 First was Mickey, Kelli and I went first to show her how fun and exciting it was. It did not help. When it was their turn she was unsure at first, then started to cry. Pictures were taken with a not so happy Maddie. 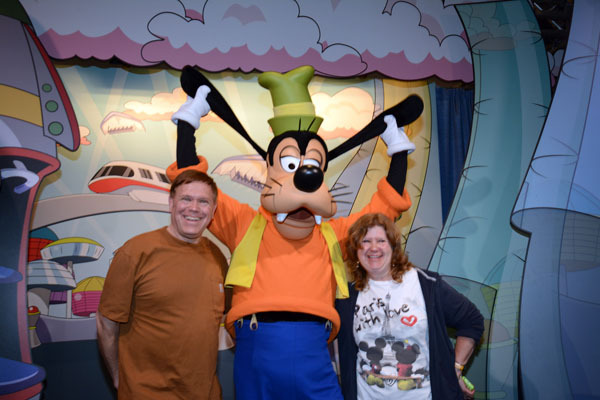 Goofy was worse, since he’s so tall. 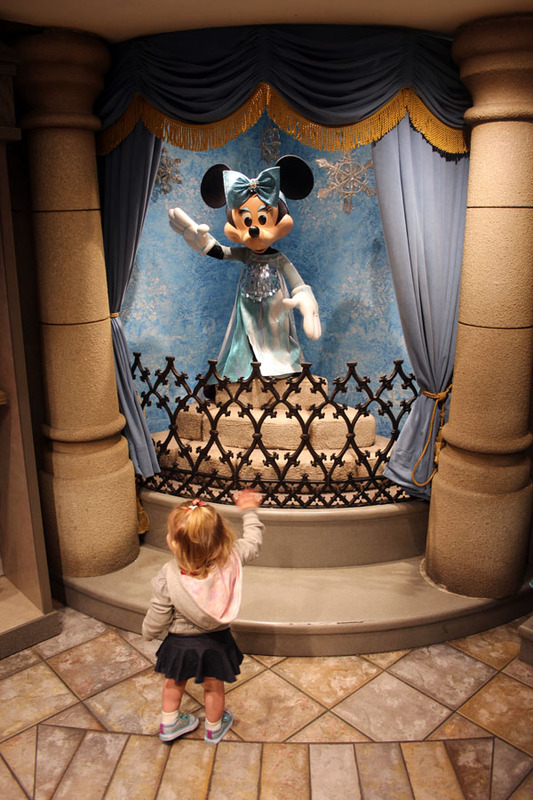 She did slightly better with Minnie Mouse and eventually gave her a high five. 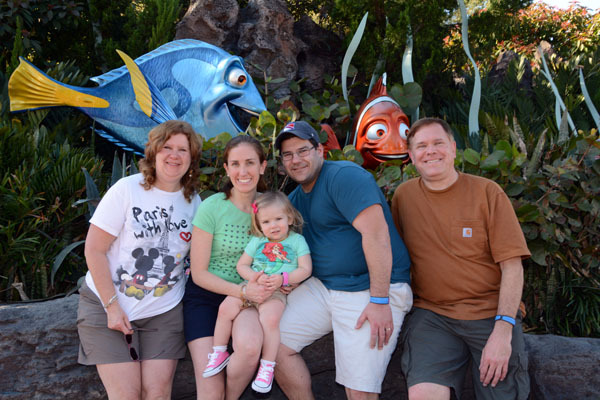 We headed over to The Seas with Nemo and Friends but not before a few pics outside. She was fine till the seagulls started barking Mine! Mine! Mine! We all enjoyed looking for Nemo in our clammobile, then observing the manatees and other aquariums. Crush was starting in ten minutes so we waited for the next show. Marissa, Kelli and I enjoyed the games in the waiting area. Crush was great. One boy asked the question of how many times he goes to the bathroom. 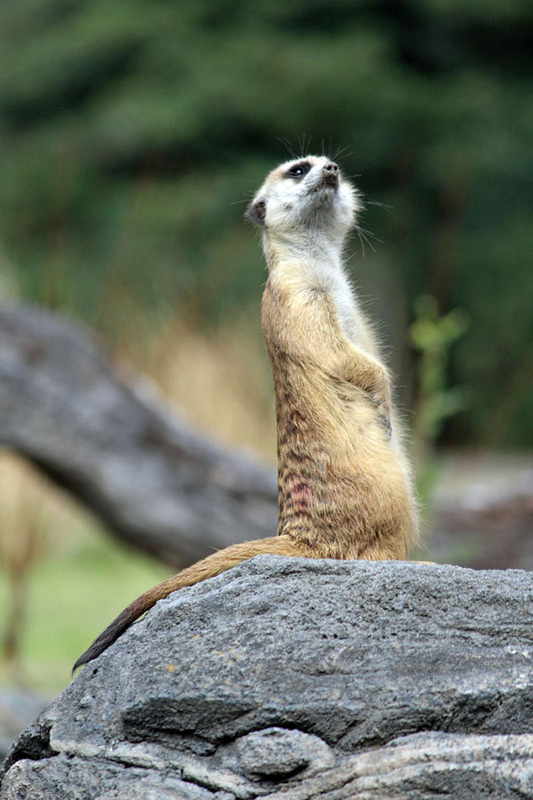 Crush hid behind some rocks for a moment then came back and said; “At least once today”. He then continued on how embarrassing it is to “have the bubbles” while bubbles started floating up from behind him. 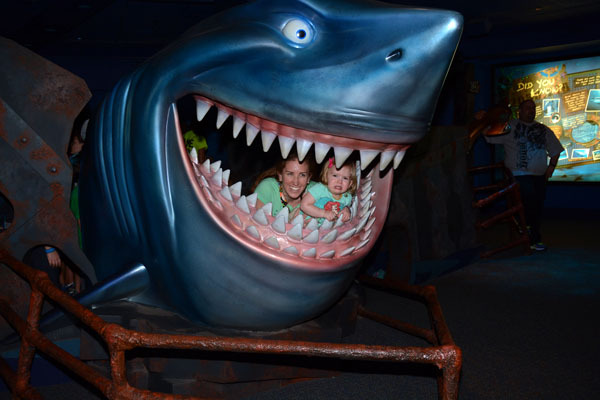 After the show, Marissa took Maddie to take a picture with Bruce the Shark. That didn’t work well either. 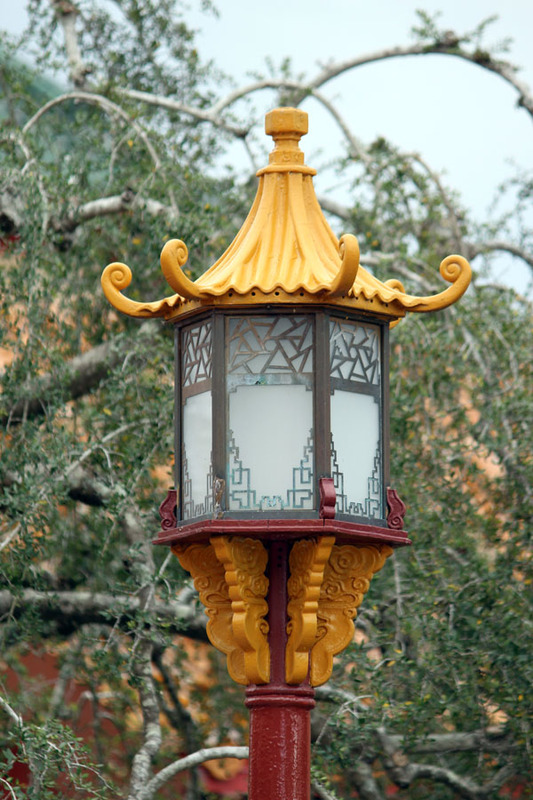 We did some shopping in the Seas Pavilion, then headed towards the World Showcase for dinner. Tim and Marissa wanted to take the long way around to Norway, but I wasn’t up to it. We split up. Kelli and I did some shopping in the Showcase Plaza, stopped for a Strawberry Margarita in Mexico, saw an Anhinga in a tree ( a bird found in Florida aka the Snake Bird) and met everyone in Norway. 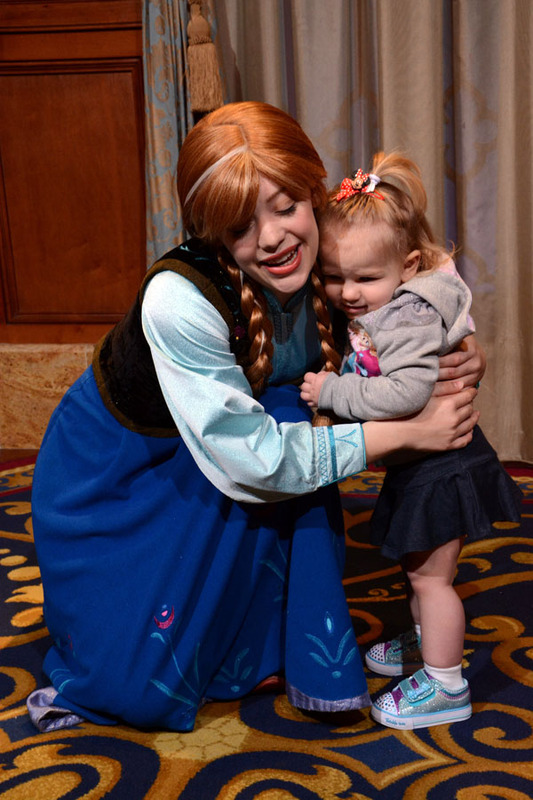 Marissa changed Maddie into her Princess Elsa Dress. 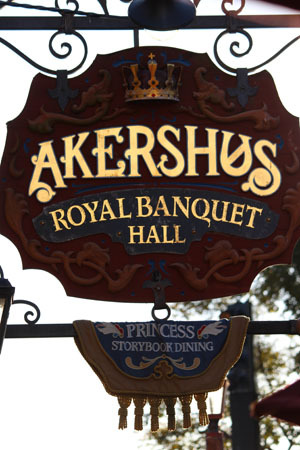 We checked in for Akershus Royal Banquet Hall and had a moderate wait. 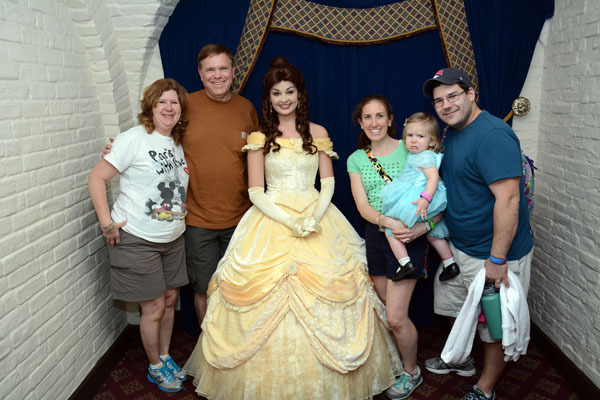 We took pictures with Belle then were seated. For drinks Tim ordered the New Belgium Fat Tire, I had a Carlsberg (a light lager from Denmark), Maddie had an Ariel punch with glowing Ariel. The Taste of Norway appetizers were delicious. It features some of the finest Scandinavian seafood, imported cheeses, like Jarlsberg and Muenster, cured and sliced meats, and a vast selection of salads and fruits. I especially enjoyed the grilled asparagus and a brown cheese called Gjetost, a Norwegian cheese made of goat's milk. The Smoked Fish Salad, Shrimp Salad and Cucumber Salad were good too. The Peppered Mackerel was a bit fishy but good as well. 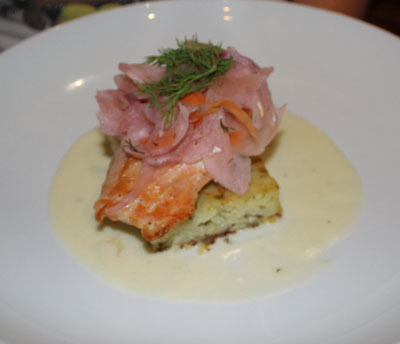 Kelli and Marissa ordered the Pan-seared Salmon - roasted potato cake, pickled fennel slaw and aquavit cream sauce. 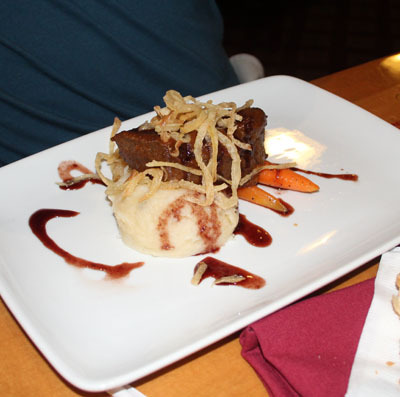 Tim had the Red Wine-braised Beef - roasted garlic and cheddar mashed potatoes, seasonal vegetables, and strawberry port demi. 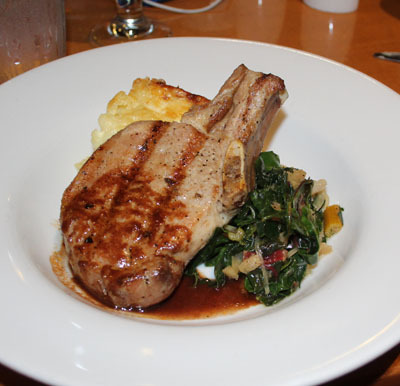 I tried the Grilled Pork Chop - with Jarlsberg baked mac & cheese, and port jus. I loved the Jarlsberg baked mac & cheese. We all loved our entrees. Maddie had the Kids Meatballs - Norwegian Meatballs (Kjøttkake) served with Mashed Potatoes, Corn and juice. Dessert was family style with a selection of; Sweet and Savory Chocolate Mousse; Traditional Rice Cream - topped with Strawberry Sauce; and an Apple Cake with cardamom whipped cream. Kelli and I liked the apple cake the best. 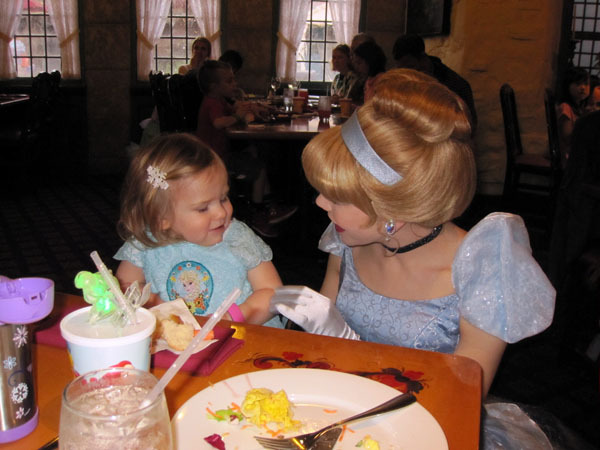 The Princesses were wonderful. 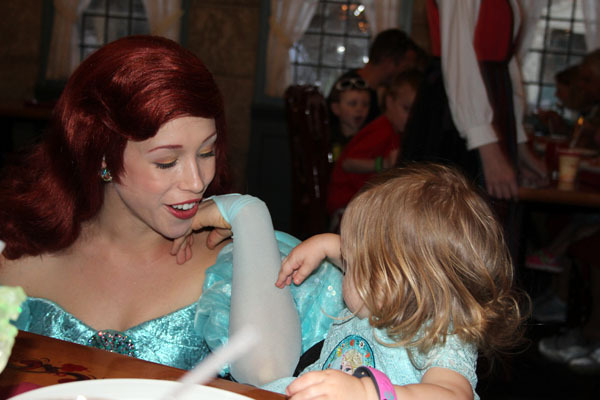 Jasmine, Cinderella, Aurora, and Ariel all came to our table. 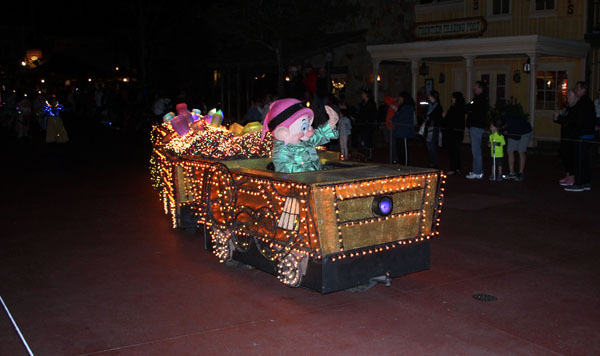 At first Maddie was hesitant with them after her interactions with Mickey and Goofy. But they showed patience and forethought, approaching her slowly till Maddie warmed up. 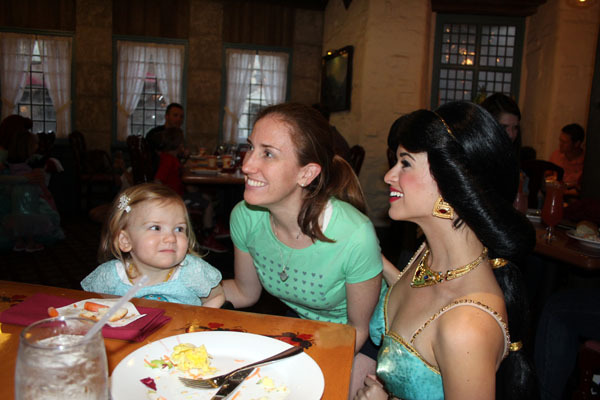 She loved Jasmine’s and Ariel’s “bling” on their dresses and gave all the princesses a high five. 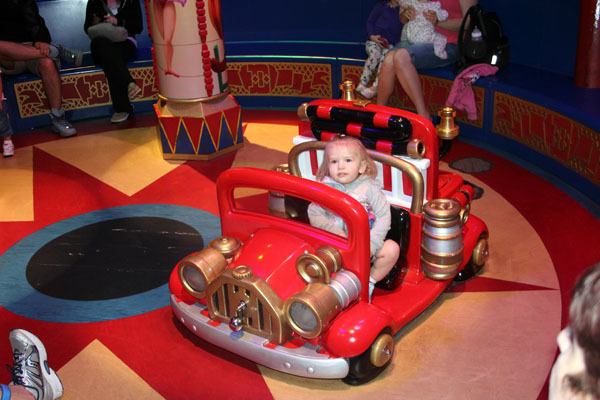 We knew Maddie would like the Gran Fiesta Tour Starring the Three Caballeros so we stopped in Mexico and rode. We stopped in Mouse Gears for some shopping. Marissa needed a hooded sweatshirt since the weather was colder than expected. We then headed out; it had been a long day. 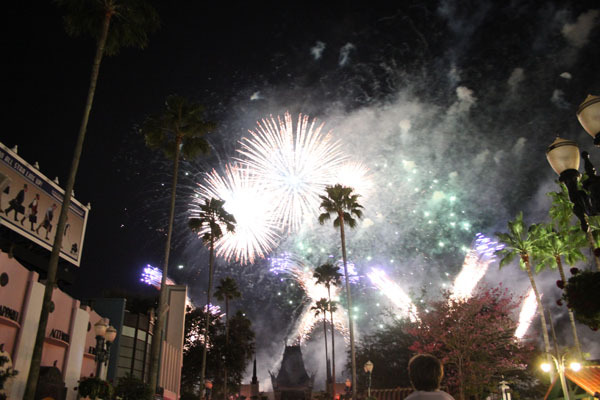 When we got off the bus at Art of Animation, the Star Wars fireworks at Hollywood Studios could be seen. We watched them from the depot. Tim and Marissa bought a case of water for only $12. This is a good way to save money. Chill them in the refrigerator and take a few to the parks. Back in the room we were all dead tired – but not Maddie! She was running all around the two rooms. Where she got the energy after being up so early and barely napping we will never know. We woke up early at 6 to make sure we’d make the Welcome show (opening ceremonies) for the Magic Kingdom and to dash to see Elsa and Anna. At breakfast we bought four rapid refill cups with the new design using my Tables in Wonderland Card. The cups might not be worth it for 4 days at $17 each, but the 20% discount decreased it to a moderate $13.60. We saw the opening show start as we made our way through security. 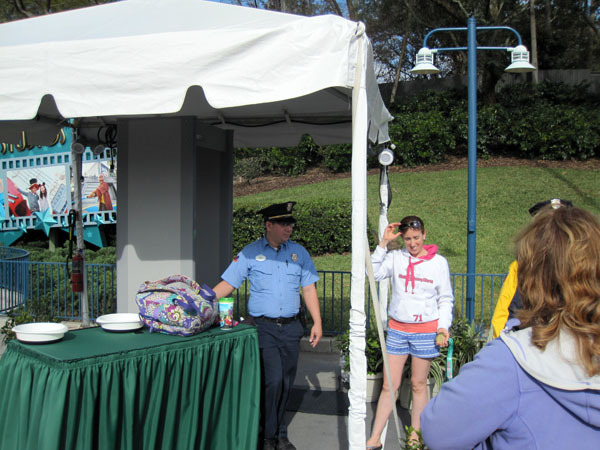 Marissa was again “randomly” selected for the new metal detectors. 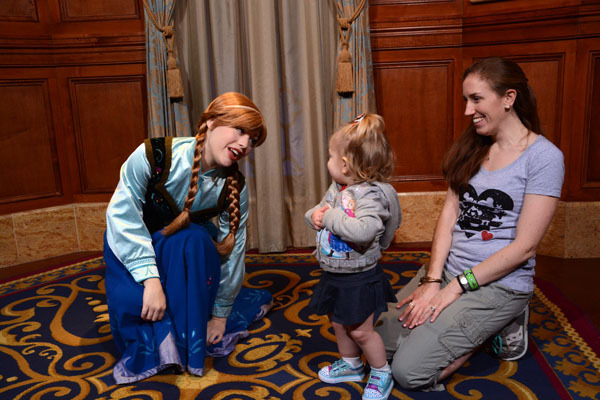 We lost track of each other so we texted that we will meet at the entrance to the Anna and Elsa meet and greet at Princess Fairytale Hall. 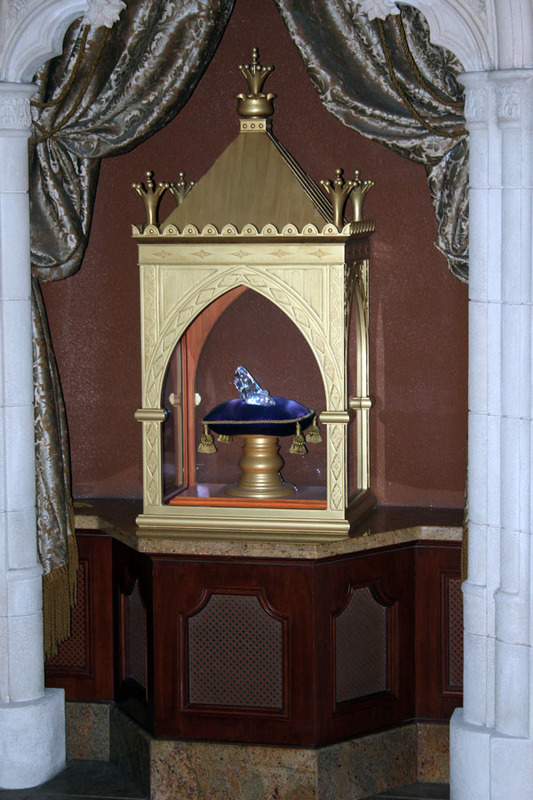 In the queue the glass slipper from Cinderella was on display. Maddie was still a bit apprehensive but the photos were much better this time. 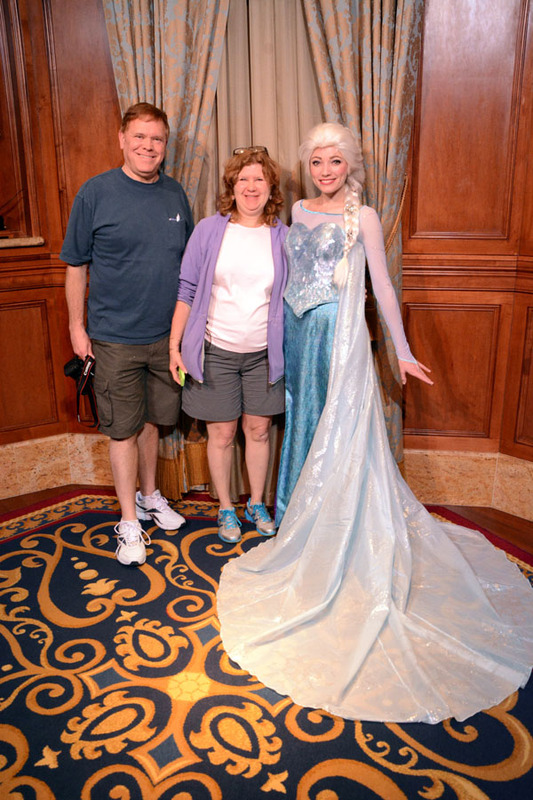 After meeting both princesses we made our way into the gift shop, stocked with Elsa, Anna and Olaf merchandise. 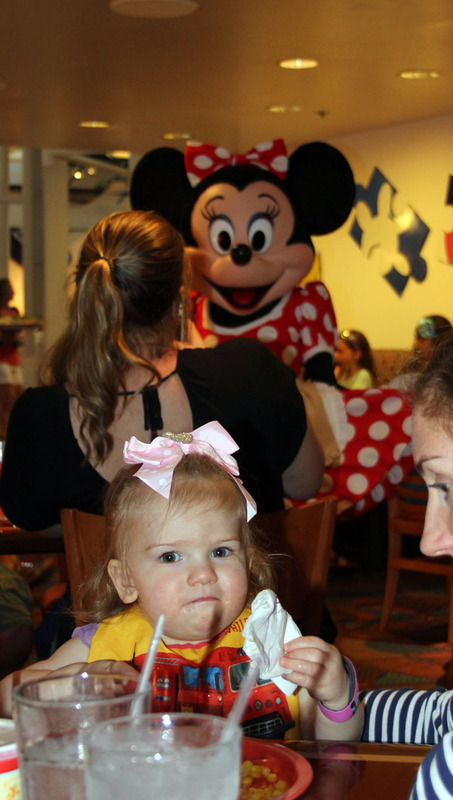 When Maddie entered she let out an “Ooooooh!” She also like the statue of Minnie Mouse. 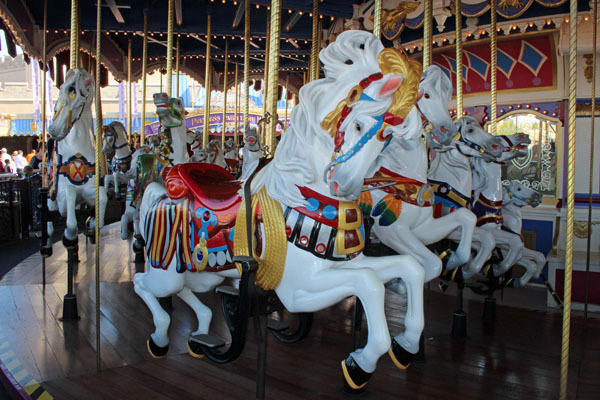 We made our way over to Peter Pan and saw the Step Mother and Sisters were riding the carrousel. Peter Pan had a 50 minute wait. The line looked shorter from the outside but this queue has lots of back rooms. The good news is that some have interactive areas making the wait much easier. In one area Tinkerbelle is exploring the children’s bedrooms, opening drawers, lighting up lamps. It was very well done. The coolest part was the shadow wall. Your shadow appears on the wall. At times your shadow will break up into dozens of butterflies; or a shadow butterfly will land on the shadow of your hand (keep it still). 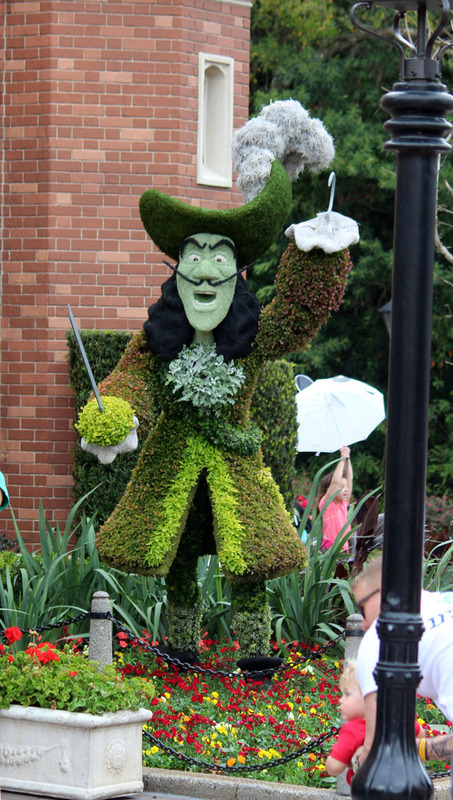 Another effect will put a Captain Hook shadow hat and hook on your head and hand. Our next ride was Winnie the Pooh using FastPass, followed by the Little Mermaid. 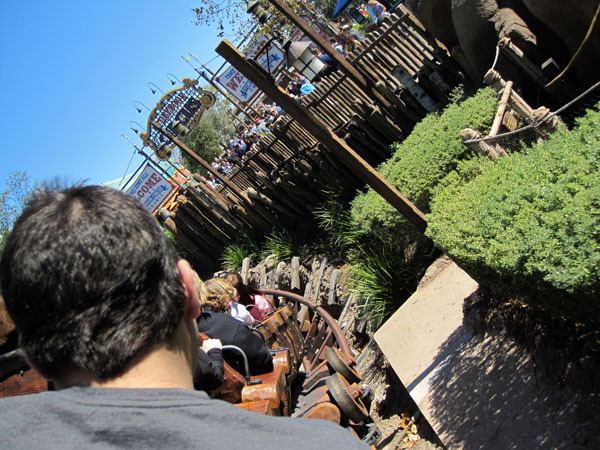 The Seven Dwarfs Mine Train was next. Kelli and Maddie sat this one out. I was sure I would not fit into the smallish seats I’ve heard so much about due to limited flexibility in my hip. I was ecstatic to find a position to fit by scrunching down and one knee up high. I took some action shots during the ride. We crossed over to Tomorrowland where Tim and Marissa tried to ride Space Mountain. 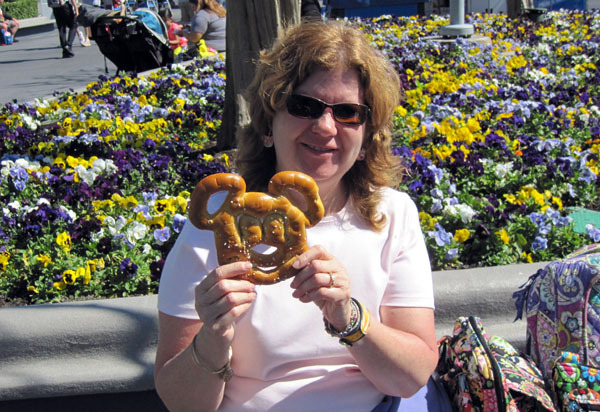 Kelli and I split a Mickey Pretzel from the Lunching Pad while watching Maddie. 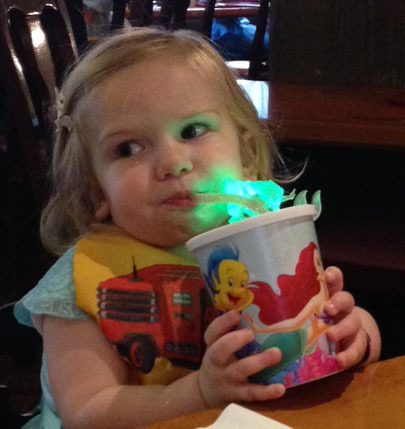 Kelli brought a Pluto for Maddie in Mickey's Star Traders. It was very relaxing with warm weather and people watching. Tim and Marissa came back 45 minutes later, the line was barely moving so they jumped off the line. Lunch was at Cosmic Rays; turkey sandwich, pork sandwich, hot dog, and chicken nuggets. We had a seat right near Sonny Eclipse. I always enjoy his corny jokes and out of this world songs. We got some Iced Coffee at Cheshire Café and saw Pooh walk by then crossed the park to Adventure land. 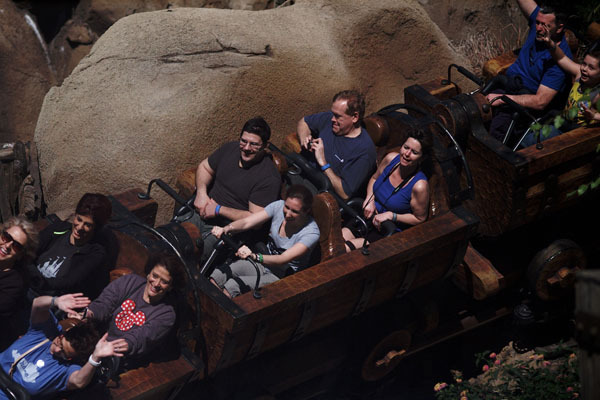 Tim, Marissa and I rode Big Thunder Mountain Railroad using Fastpass. They were in the row behind me so I tried to video them pointing my camera backwards. On one tight turn I had to laugh out loud as I slid across the seats since I was not holding on. Kelli took Maddie shopping and promised her anything she wanted. 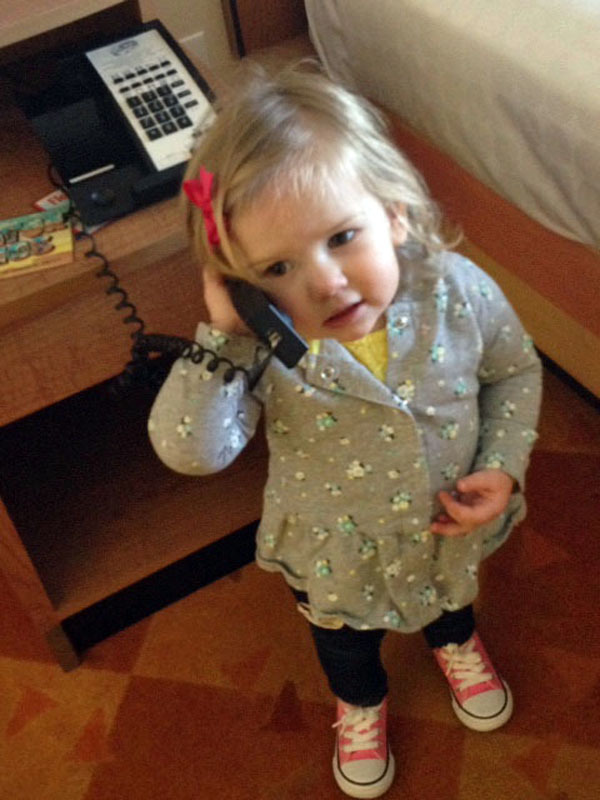 Like a true female Maddie picked up and put down many things – and walked away empty handed. We shopped for pins in Frontier Trading Post. A Great Egret was hanging out with the crowd just outside. We also stopped for a soda and snack in the Prairie Outpost and Supply store nearby. We had time before the parade so we took in the Country Bear Jamboree show. 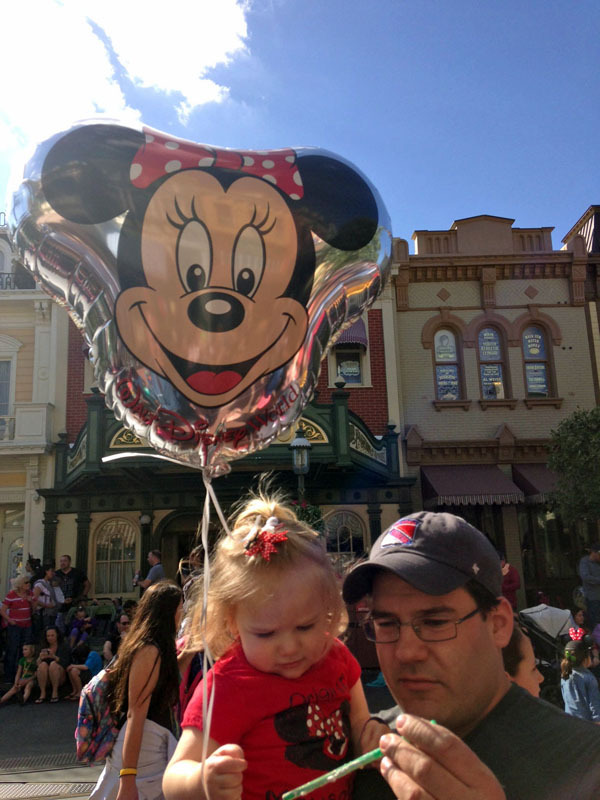 Kelli wanted to buy Maddie a Mickey Mouse balloon so we headed to Main Street, passing a piano player outside Casey’s Corner. We found a spot halfway down Main for the parade. I discovered a Eurasian Collared Dove building a nest in one of the small trees lining the street. I guess it did not mind all the noise and commotion. 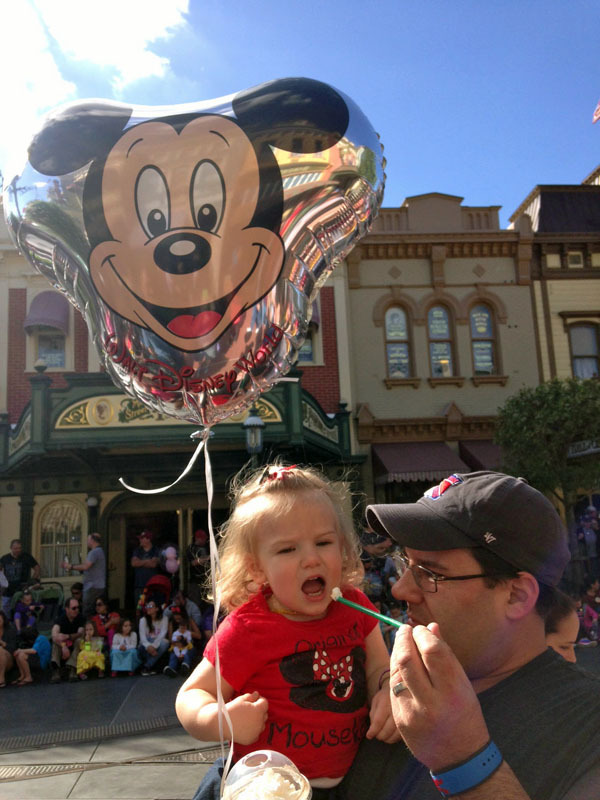 The Festival of Fantasy Parade was new to all of us. 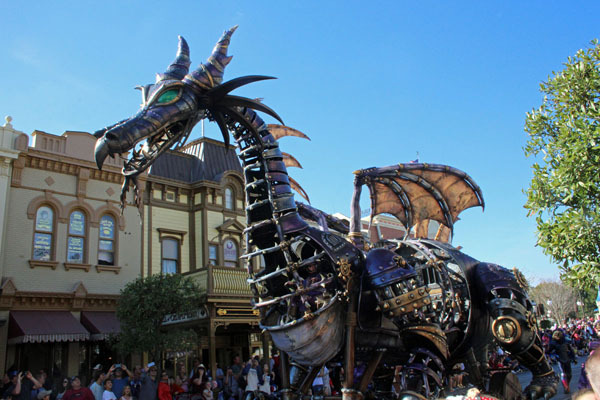 Maddie like all the princesses and I loved the Maleficent, fire-breathing, clockwork dragon. After the parade we swam upstream to get to Fantasyland and rode the Prince Charming Regal Carrousel followed by Mad Tea Party. The cup vehicles are small. Maddie, Marissa and Kelli rode in one for a mild ride. 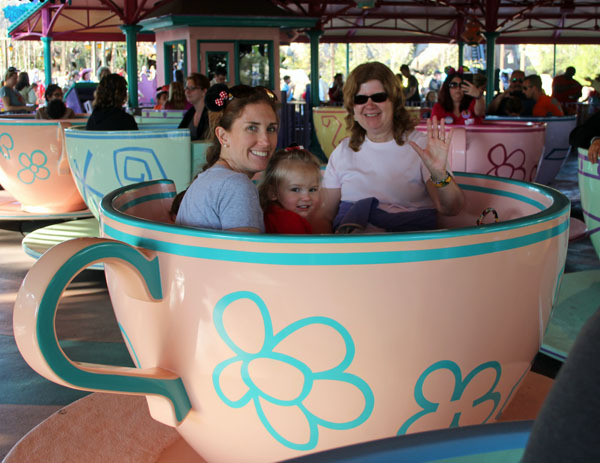 Tim and I crammed into another and spun that teacup as fast as we could. I stumbled out of the cup being just a bit dizzy. 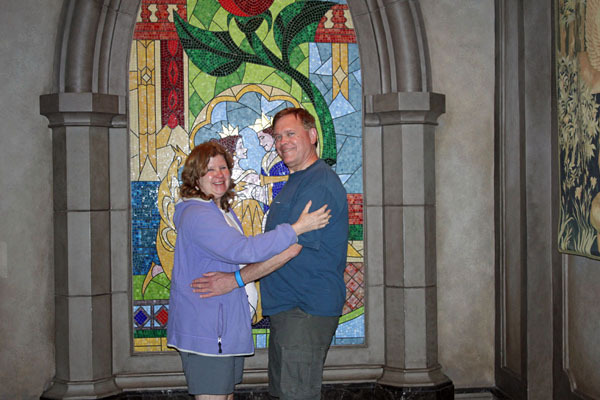 It was finally time for dinner at Be Our Guest. 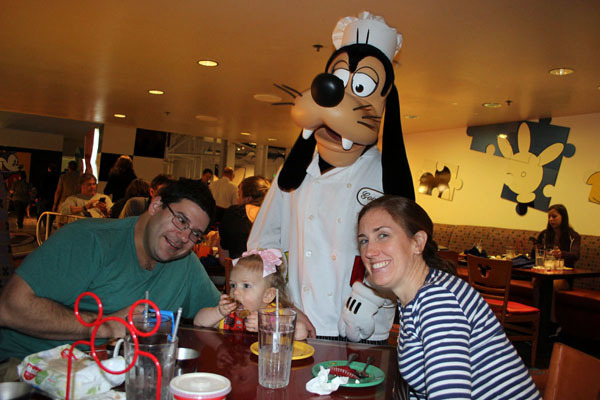 We had a very short wait since they just opened and were seated in the main dining room. The Beast passed by and we knew Maddie did not want any part of him. Marissa and Tim snuck away to get a picture with him with little wait and explore the other two rooms. This is a good tip. 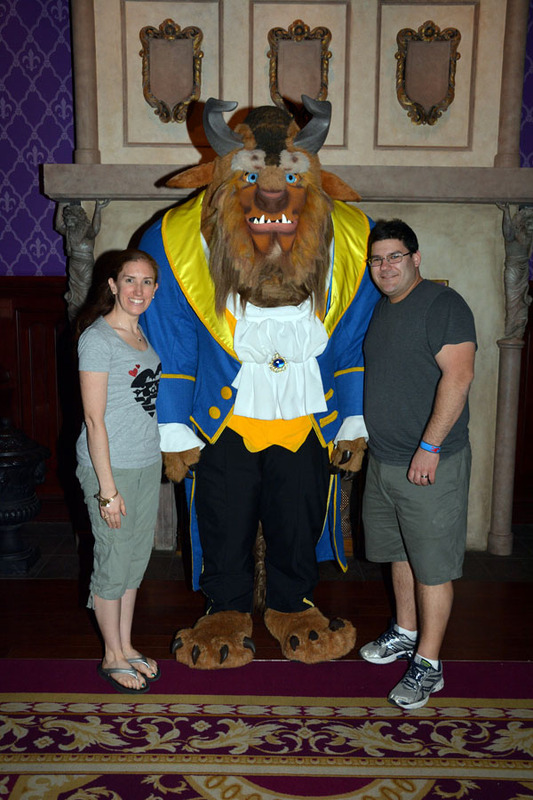 If you are there near opening, get a picture with the Beast while waiting for your entrees. The line will be shorter than if you wait till after you eat. Tim and I ordered beers, Chimay Blue, Grande Reserve and a Kronenbourg 1664 and I tried some of their Potato Leek soup which had a nice kick to it. We all ordered different entrees and everyone enjoyed them. Pan-seared Chicken Breast - finished with fresh Herb-Truffle Butter and Spinach Cream Sauce, Seasonal Vegetables, and Roasted Fingerling Potatoes. Desserts included Triple Chocolate Cupcake - Chocolate Sponge Cake, Chocolate Mousse Filling, and Chocolate Ganache; The "Grey Stuff" - Chocolate Shell, Cookie Crème topped with Lumiere’s special “Grey Stuff” and an Éclair à l’Orange - Custard filling with zested Orange and then finished with Chocolate Ganache. Kelli did not like her Éclair, she couldn’t taste any orange and it tasted artificial. The bill came to 208.01 with tip and the Tables in Wonderland card saved $40.38. 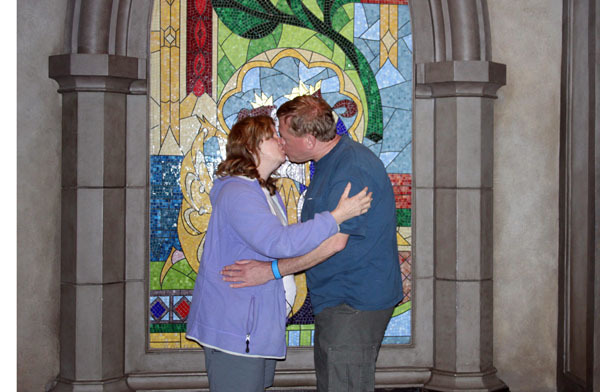 Afterwards, we checked on the rose in the Rose Room, Maddie danced with daddy in the entrance hall, while we took pictures in front of the stain glass window. 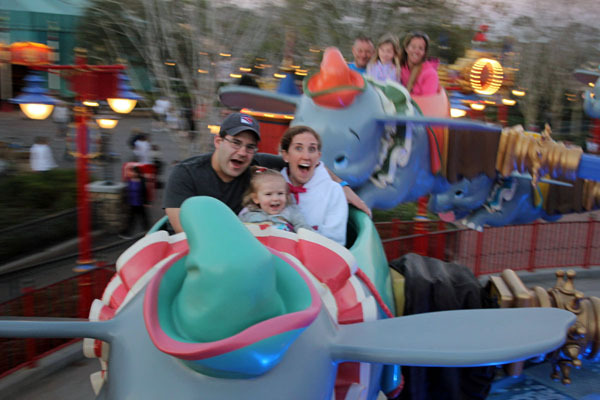 We headed for Dumbo. In the waiting play area Maddie did not like the tunnel slide but loved sitting in the fire truck. 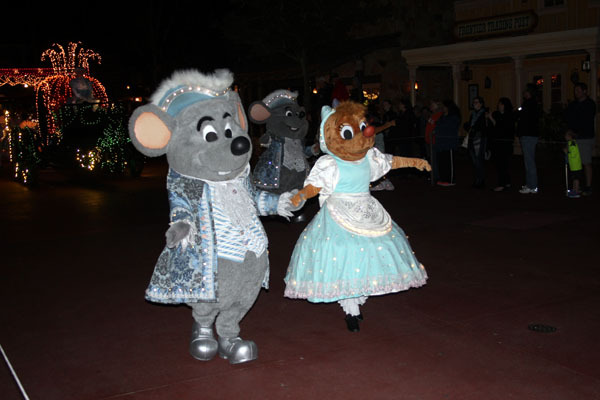 We ended the night with the Electric Parade, followed by Celebrate the Magic castle show and Wishes. Back at Art of Animation we did some shopping in the Ink and Paint Shop before getting a well-deserved rest. We woke up early again at 6 AM. 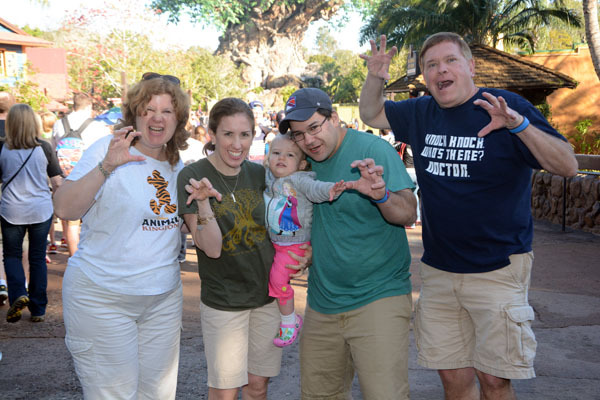 We are heading to Animal Kingdom and want to be there at rope drop. After breakfast a bus was right there and we made it to the park just after 8, much earlier than anticipated. We shopped in the Outpost shop then headed to the right side of the entrance for bathroom breaks. As we passed through security Tim blocked the view of the security guard that “randomly” selects people for the metal detector so he wouldn’t pick Marissa for the third straight time. 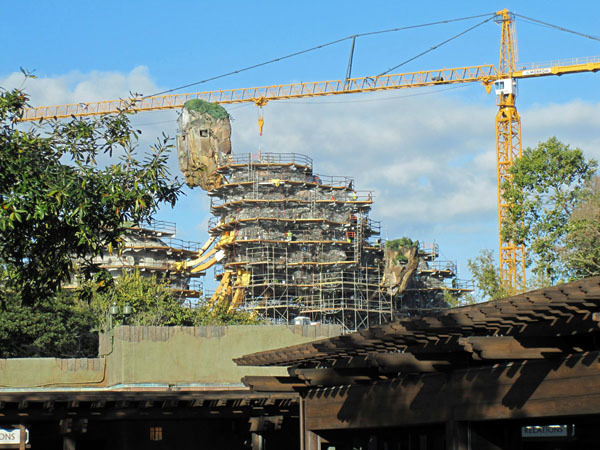 The construction of the floating mountains of Pandora loomed to the left. Looks like the area will be tall and huge. The park opened at 9. We went up the right side of the Oasis. The ten foot tall Miss DiVine just finished meeting people off to the right. 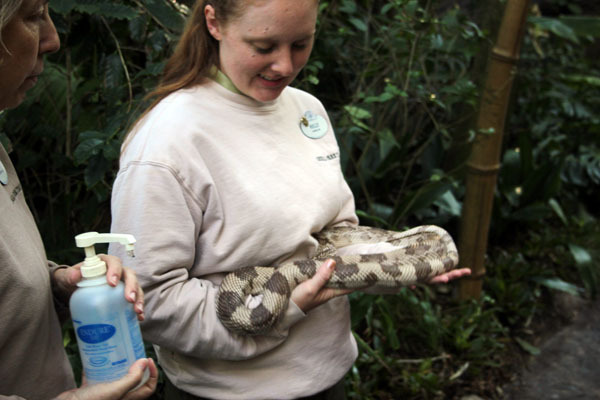 Further up was a cast member holding a large Florida Pine Snake and was explaining all about it. We stopped on the bridge to take some photopass pictures. 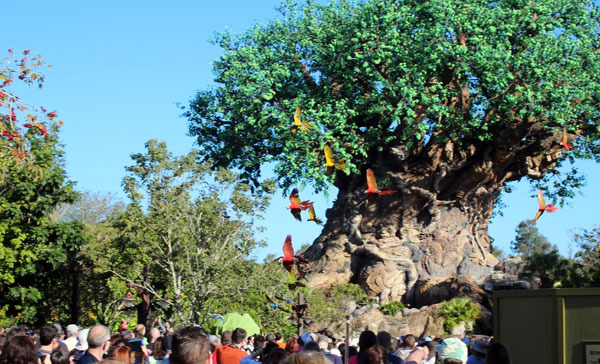 The short opening ceremony started with about a dozen parrots flying around and finally landing on a structure on Discovery Island. Our first fastpass for Expedition Everest started at 9:15. Tim, Marissa and I rode. Marissa shopped for a Yetti for Maddie in the gift shop and I notice a selection of old cameras behind one of the checkout counters. We crossed the park for the first showing of the Festival of the Lion King. 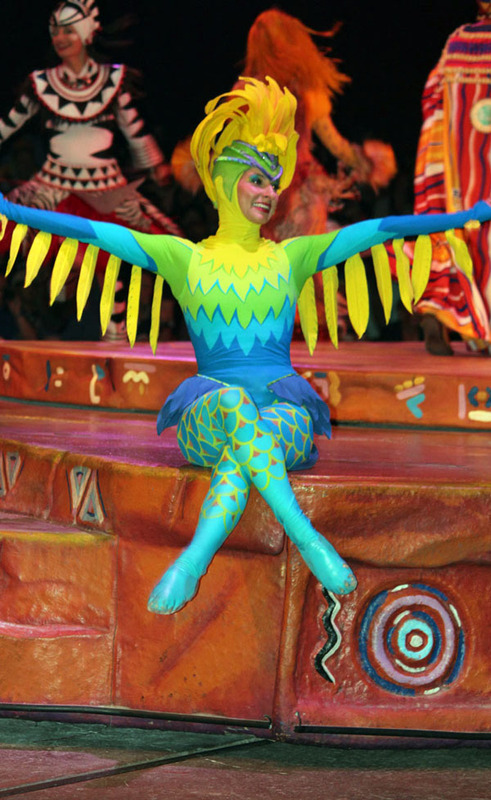 I got sidetracked with a cast member and a Trumpeter Hornbill. She would let people throw grapes up in the air and the bird would fly up to catch them. 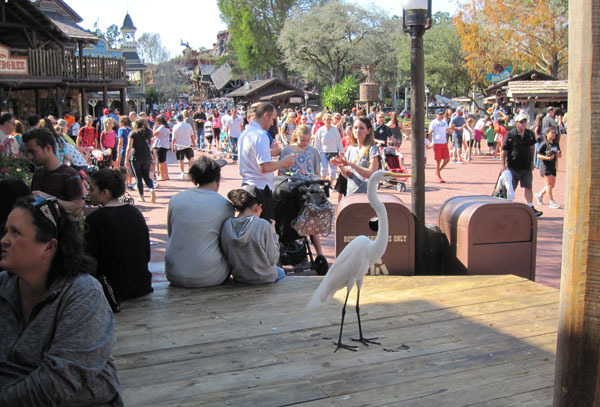 The bird also flew across the river to waiting cast members on the other side, then back again. 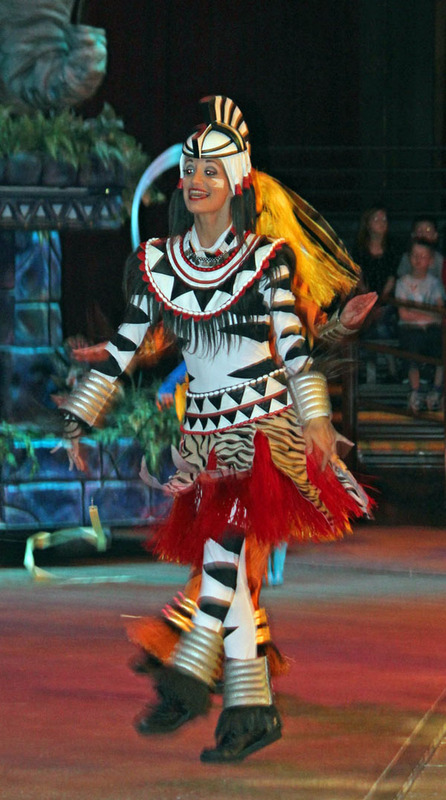 Festival of the Lion King was great as always. We sat in the Warthog Section. 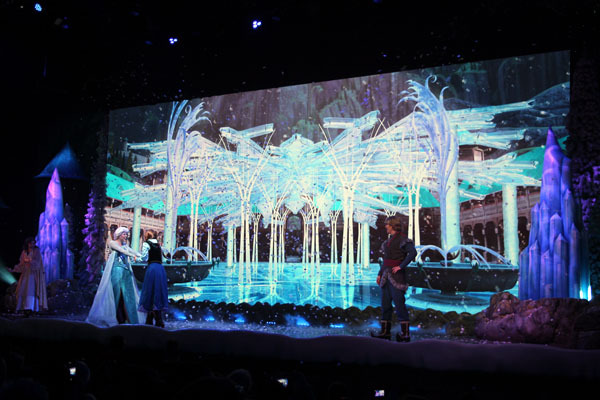 In September we had to wait in our seats after the show ended so that they could move the floats back behind stage again. 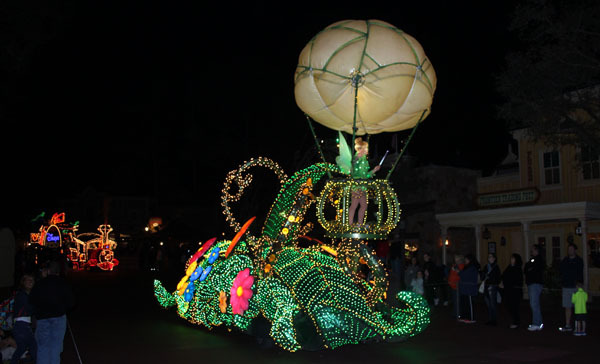 This time we could leave right after the show with the floats still out. The Pangani Forest Exploration Trail was next. 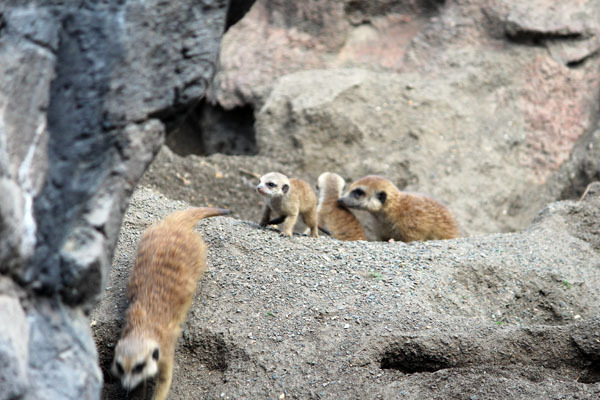 The highlight was a few baby Meer Cats scurrying around just outside their burrow. The bird exhibit is always great as well. We shopped in the Mombasa Market place. 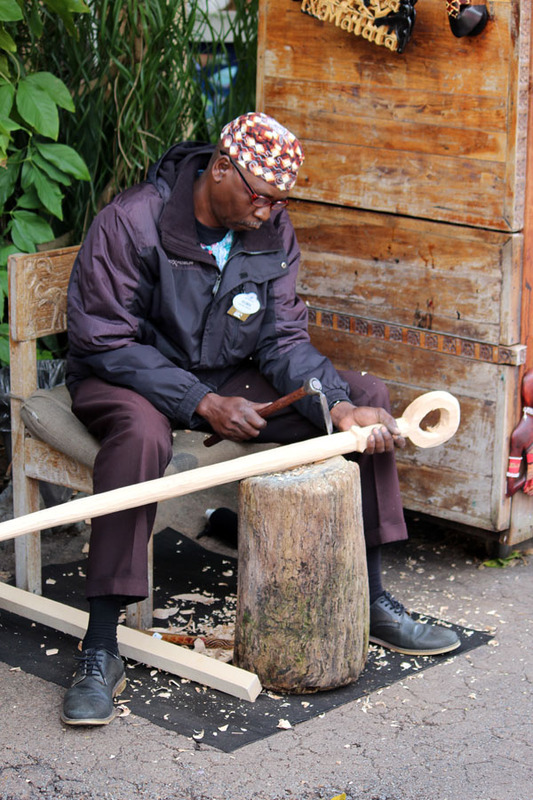 A man was outside carving a walking stick. He then taught a boy how to make a design in the stick. 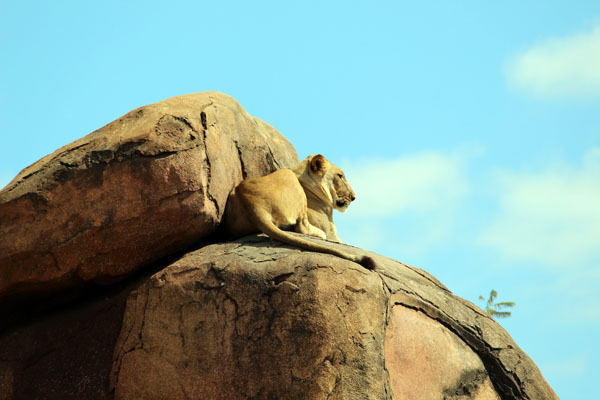 The fastpasses for Kilimanjaro Safaris were now valid. New on the trek were some African Wild Dogs, all of them sleeping. 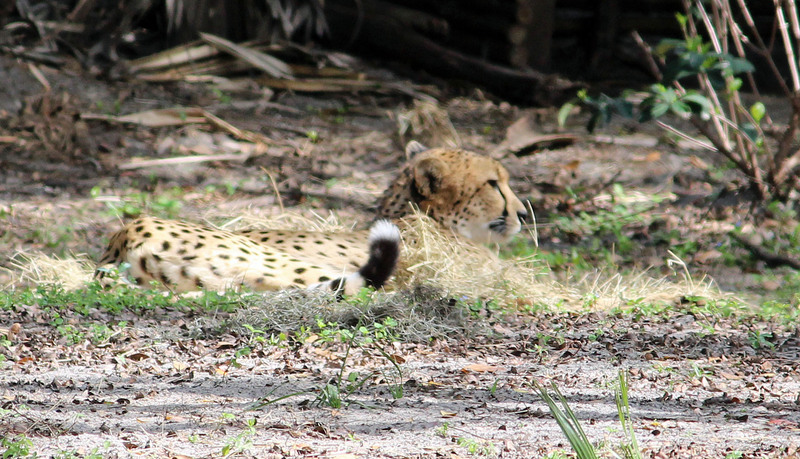 But a cheetah was out and a female lion made its way up to a high rock ledge. 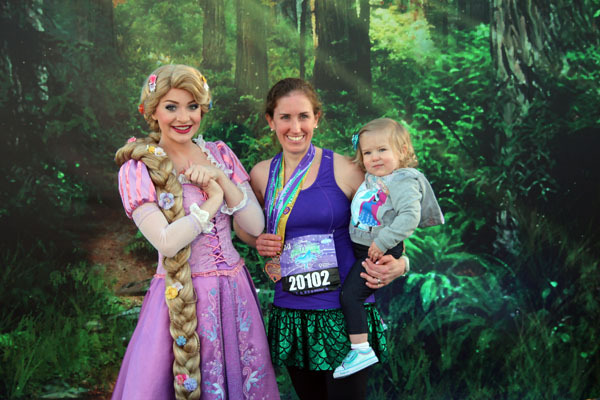 Marissa is running the 10K and Princess Half- marathon. We needed to get to the RunDisney Expo so we headed out. We just missed an Art of Animation bus so when a Pop Century bus showed up we took that. 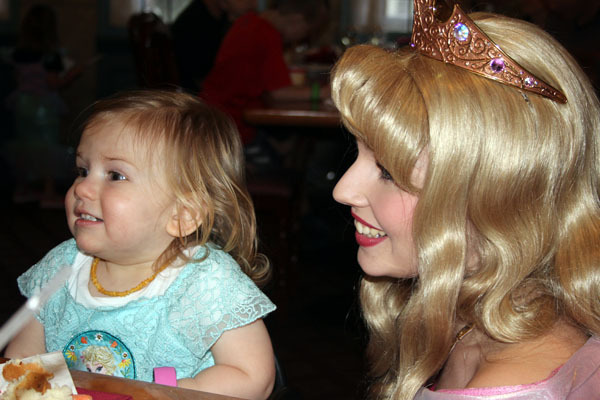 We ate lunch at Pop Century, where I also bought a cute swim suit for Kelli since she had left hers home. 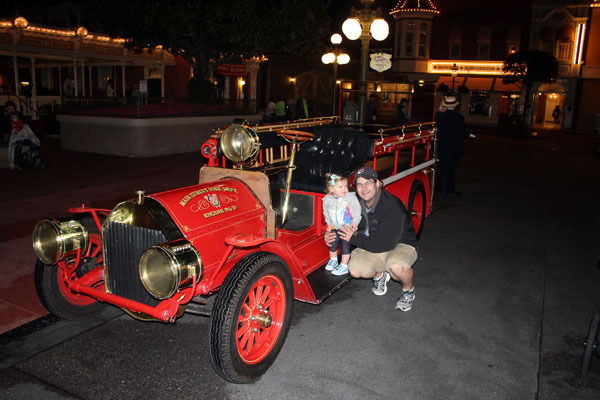 We took a special bus that goes to the ESPN Wide World of Sports Complex. Unfortunately the bus left you in a parking lot far from the building. I was tired, so we let Tim, Marissa and Maddie go ahead while Kelli and I took our time. We picked up our CHEAR squad package. 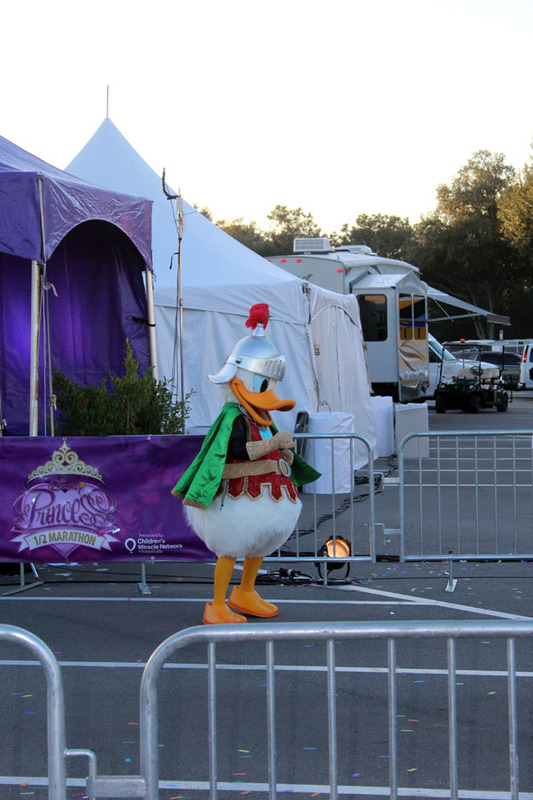 This gives us access to special viewing areas at the Magic Kingdom Castle and at the finish line. 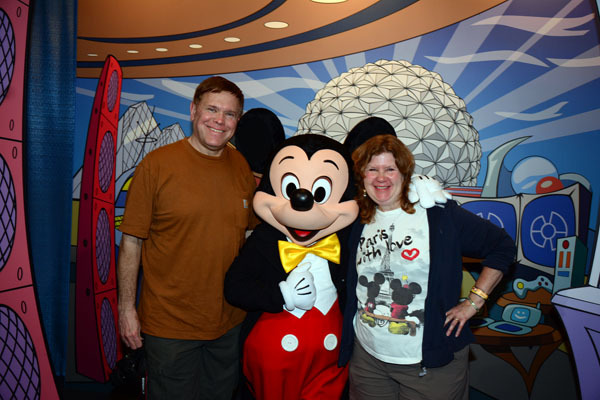 It also included a T-shirt, a blanket that folds up with a handle and a special Mickey Clapper. I headed back to the bus early, since it would take me longer. I had just gotten over a bad case of sciatica and had yet to get my legs back up to strength. 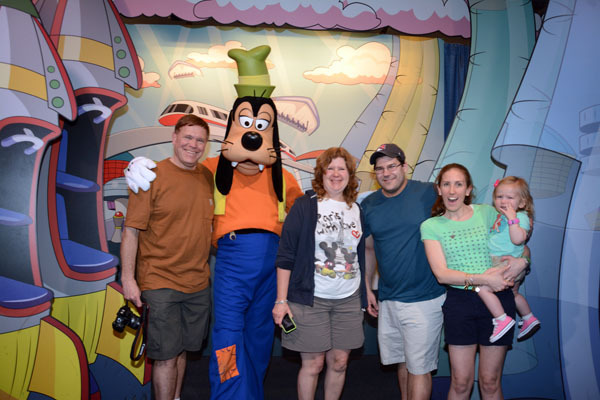 The good news is that this Disney vacation was the free physical therapy that I needed. 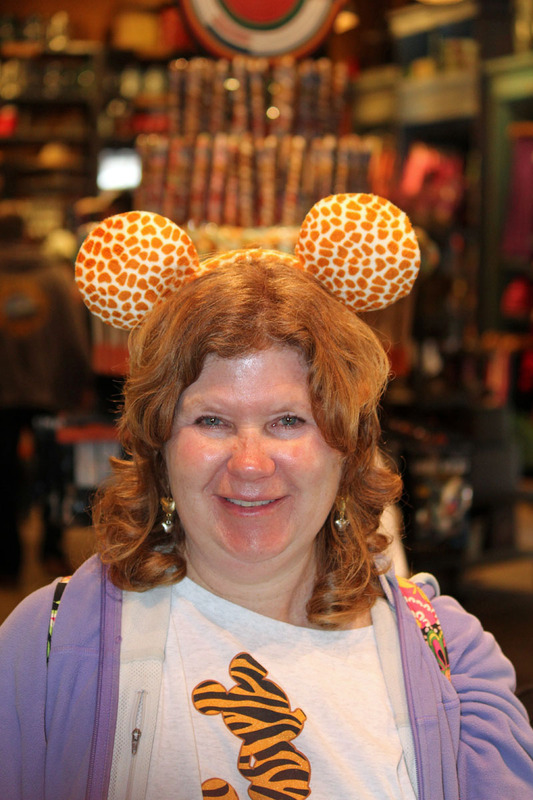 The others shopped in the RunDisney shop. I got to the buses and it was hot out there on the asphalt. I decided to take the first bus that came and met everyone back at the room. 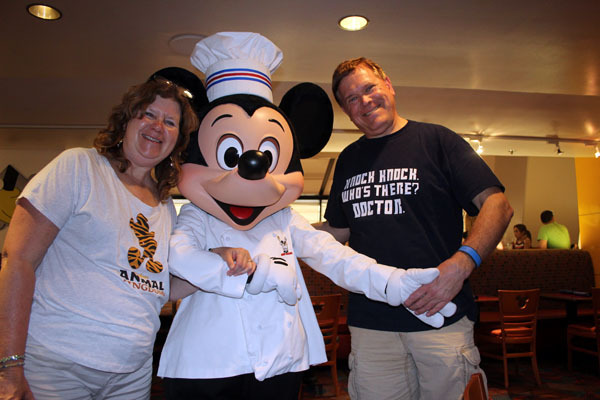 Once everyone was there we needed a quick turn around to get to our Chef Mickey’s reservation at 5:15. We left our room a little after 4. I thought, not enough time to make it. By sheer luck we walked right onto a Magic Kingdom bus. As we were heading towards the monorail we overheard that it was down, so we walked the path over to Bay Lake Tower and the Contemporary, just making it to check in a couple of minutes after our reservation! 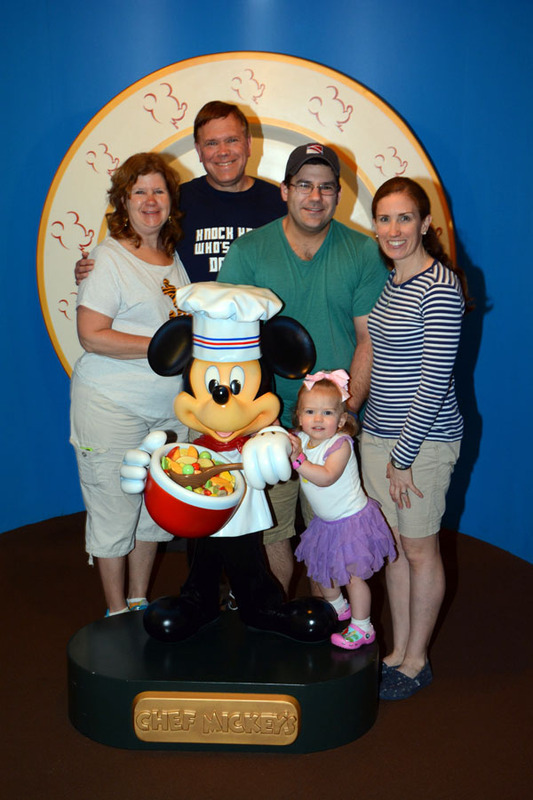 After the obligatory photos in front of the Chef Mickey plate we had a short wait for our table. The food was good. I ordered a Raspberry-Ginger Mojito. We all liked the Herb-marinated Sirloin of Beef. 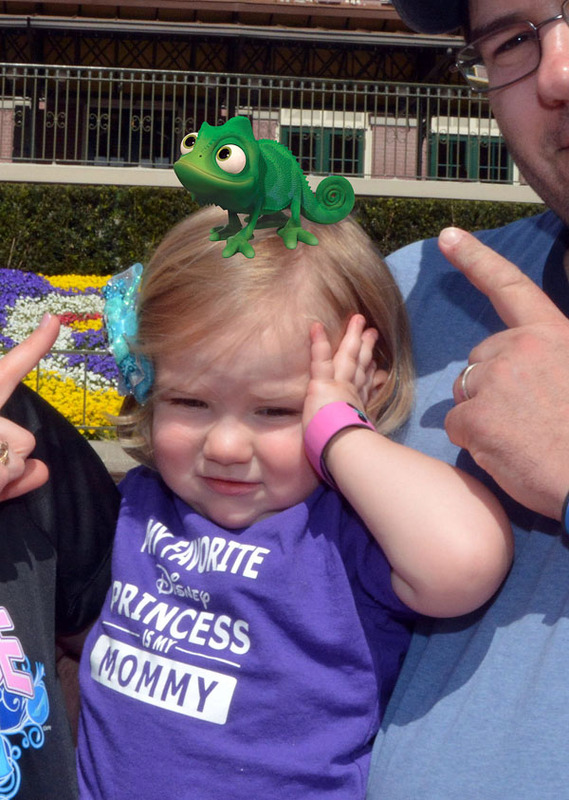 Maddie did not liked the characters. She cried when they got too near and posed for pictures. Our host was great. 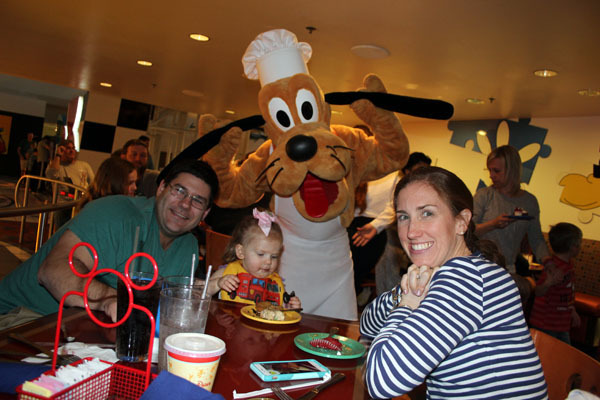 He was able to get each character to quietly position themselves behind Maddie as we distracted her while she ate and we took pictures. She never knew they were behind her. 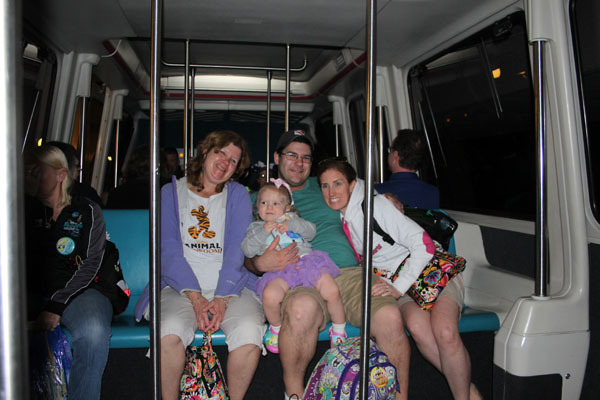 We took the monorail back to Magic Kingdom for the bus back to the resort. 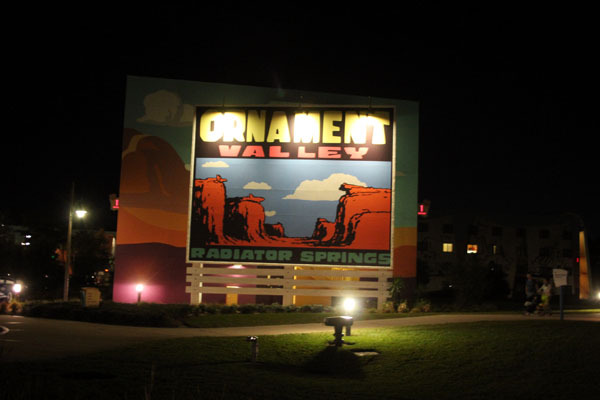 Once back I took a few night pictures of Radiator Springs. Marissa will be running the 10K race at 5:30 the next morning. 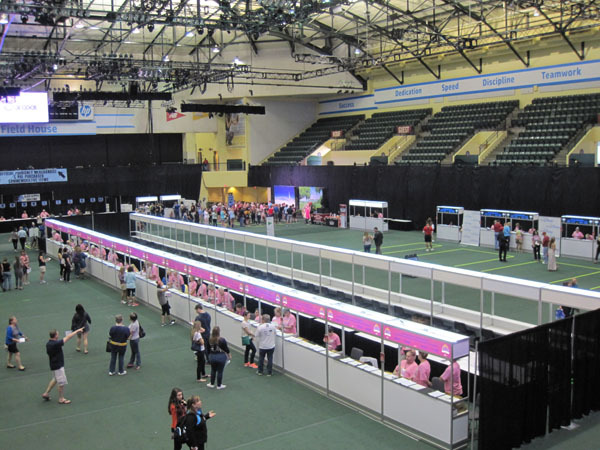 Viewing runners for the 10K is limited. It winds around Epcot and Crescent Lake. So Kelli and I slept in and looked after Maddie. She woke up shortly before Tim and Marissa got back a little after 7. 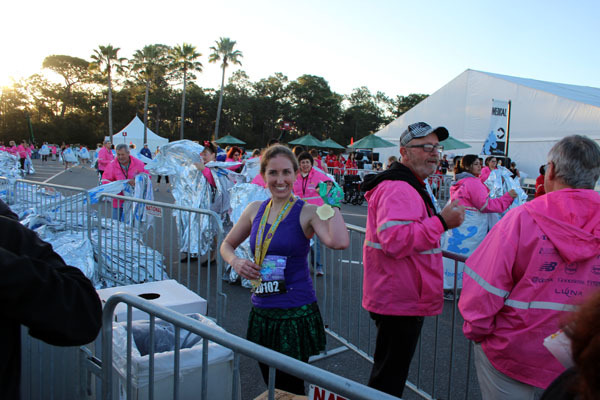 Marissa finished the 10 K in 50:49. We headed to Hollywood Studios after breakfast. At security Marissa was selected for the metal detector for a 3rd time. If she had been selected yesterday she would have been selected at each park four days in a row. Doesn’t sound random to us. It was so bizarre we all laughed about it, rather than being annoyed. 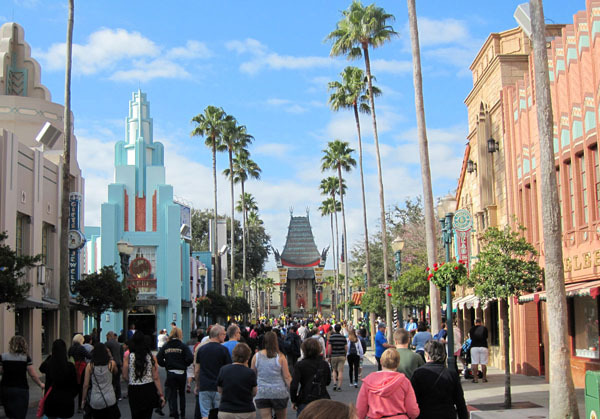 This is the first time I saw Hollywood Studios without the Sorcerer’s Hat. The Chinese Theater does look good at the end of Hollywood Boulevard. I don’t miss the hat too much. 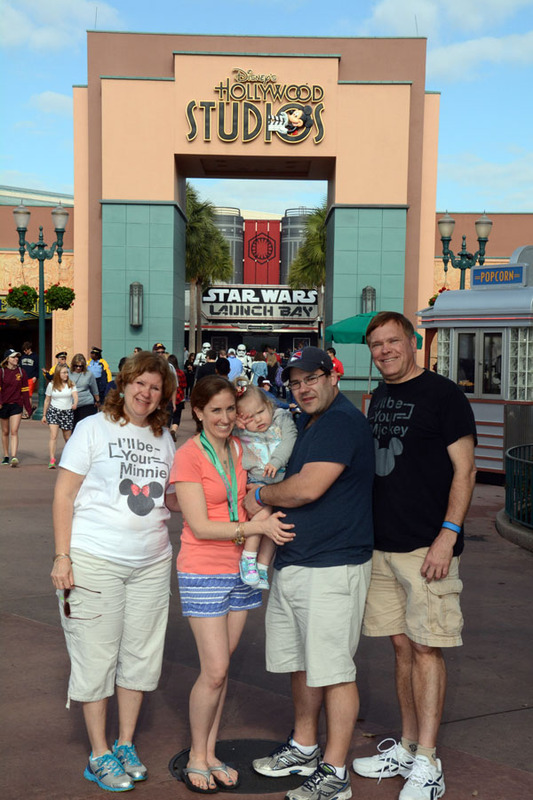 We posed for pictures on the Boulevard and the entrance to Star Wars Launch Bay. 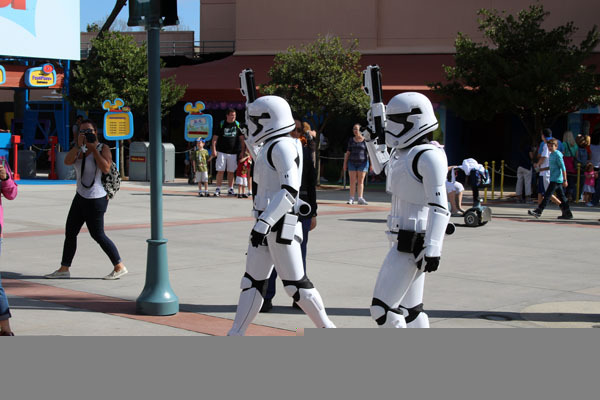 Storm Troopers were patrolling the grounds. 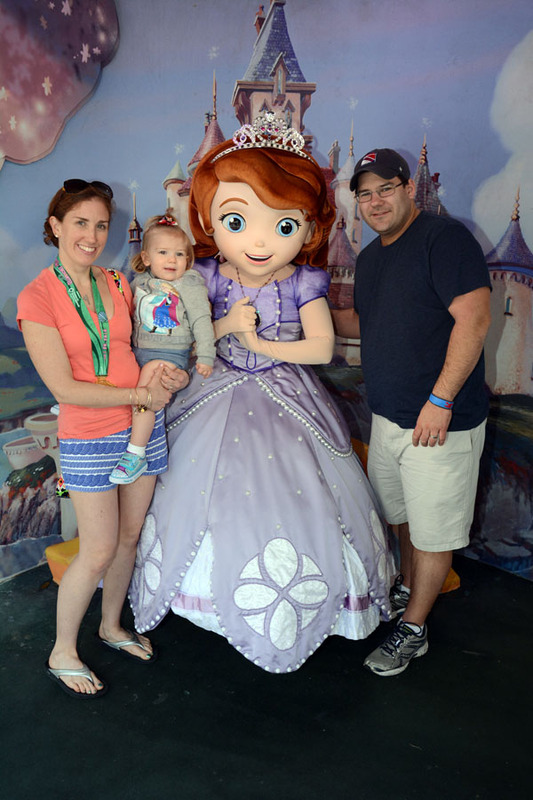 Sofia the First was out at her meet and greet so we waited on line. Maddie did much better with this character, maybe because it’s a favorite, or she is finally realizing there is nothing to be afraid of. We saw the new 10 minute movie “Dreaming on a Galactic Scale” in the Star Wars Launch Bay Theater. It is a behind-the-scenes video to see how a new generation of filmmakers is crafting the future of the Star Wars saga. 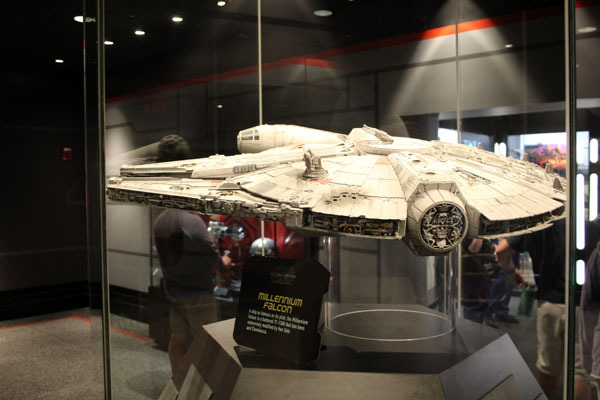 Afterwards we explored the scale models and movie props inside Star Wars Launch Bay. We had fastpasses for Toy Story. Kelli and I did well, both scoring over 100,000, I had 162,500. 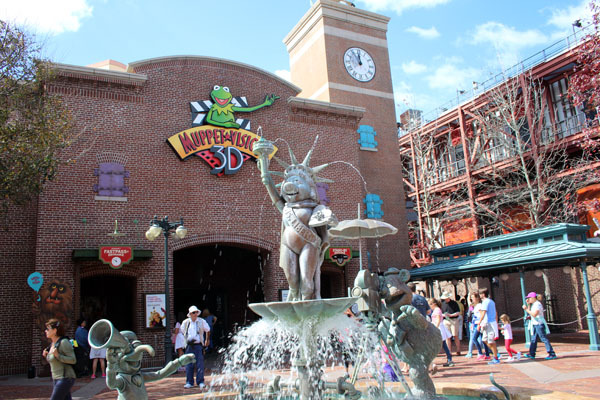 We worked our way around to the Streets of America towards the Muppets. 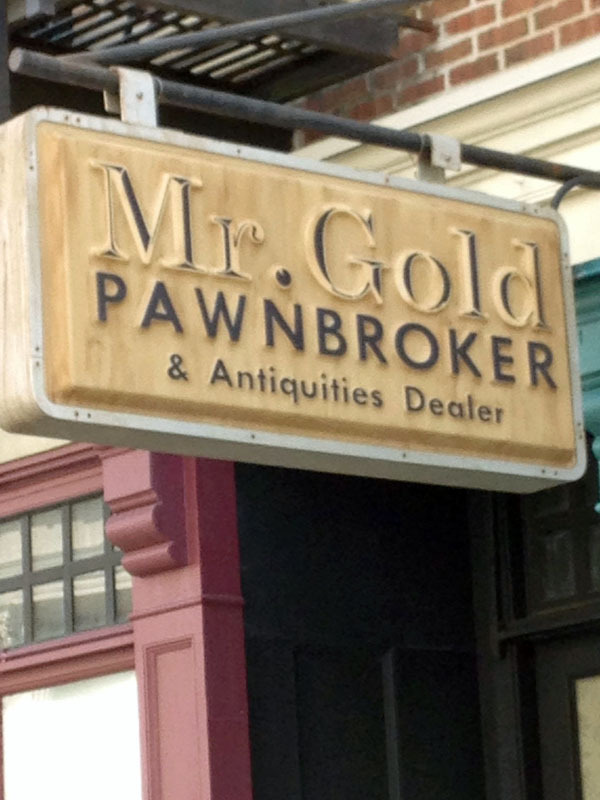 Kelli notice a storefront – Mr Gold, Pawnbroker and Antique dealer. 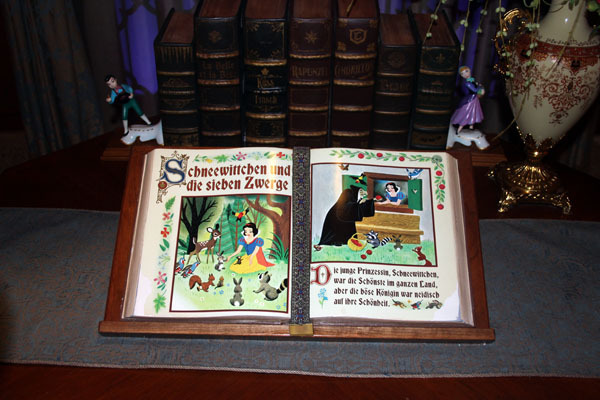 This is a nod to ABC’s “Once Upon a Time” TV show. We enjoyed the Muppets then shopped at the Stage One Company Store. Tim found a nice “UP” pin. I had to buy one too. 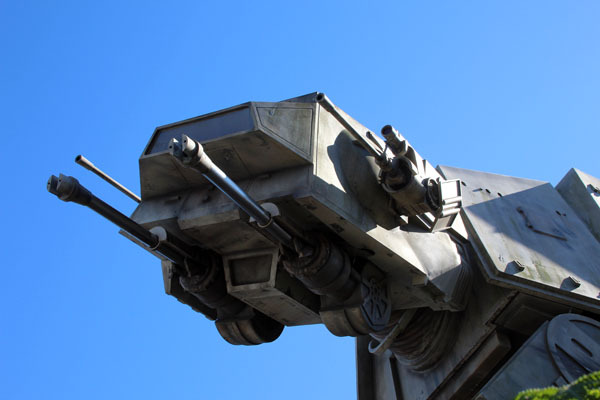 Next was Star Tours using fastpass. We saw the new “Star Wars: The Force Awakens” scene featuring Finn and BB-8. Lunch was at the ABC Commissary, a place I have not eaten in years due to long lines and annoyingly very slow service. Service was still slow but the lines not as long. 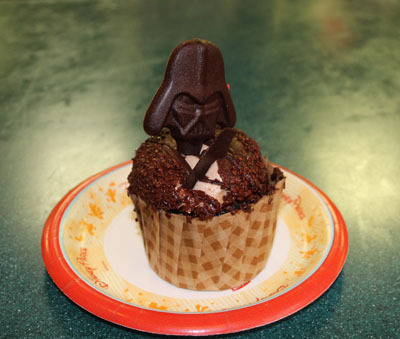 We did enjoy a Darth Vader Cupcake. We had time before our For the First Time in Forever: A Frozen Sing-Along Celebration fastpasses so we enjoyed ice-cream from the nearby Oasis Canteen. 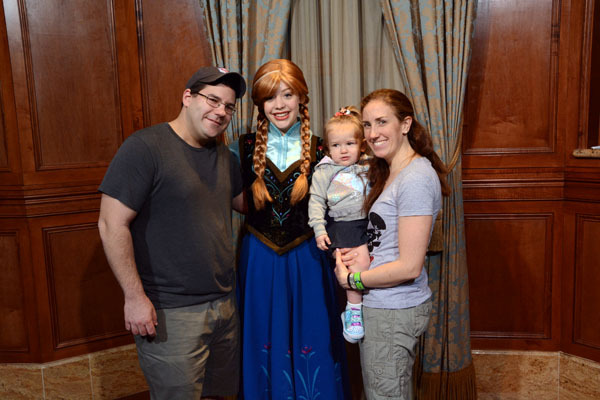 Maddie knows the Frozen songs, she, as well as her parents enjoyed the Sing-along Celebration. 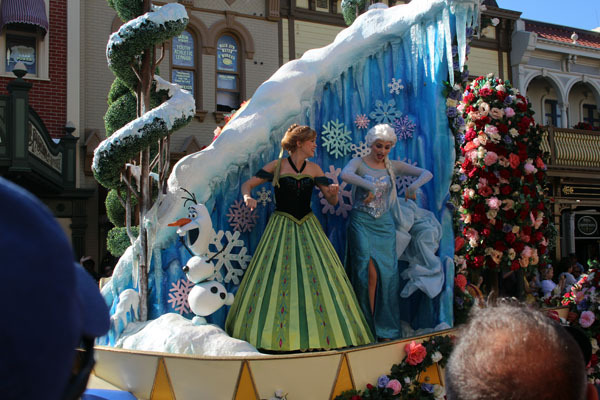 Kelli and I heard a few new jokes from the Arendelle historians. 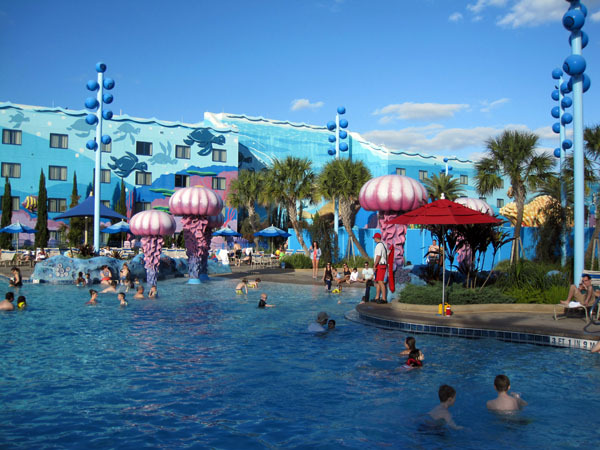 It was warm enough and we all wanted to try the Finding Nemo pool back at the resort. Kelli and I headed out early, but stopped at the Trolley Car Café for Starbucks as Tim and Marissa looked for more pins. They stopped at Starbucks as well. We noticed that the flags just outside the park were at half –staff. It was in honor of Supreme Court Justice Antonin Scalia who died a week earlier. Pool time lasted for about an hour and a half. We couldn’t find towels till we asked someone. You have to go to the front desk to get them. Kelli made the trek and handed them out. We swam and listened for the underwater music. It seem a bit distant from where we were, but we heard it. Funny thing happened. I was first to get out and the smallish towel barely dried me and I was cold till I dried out. Everyone else comes out and all their towels were large! I got the short straw (or short towel). Mine was a hand towel! We freshened up and had dinner at Landscape of Flavors food court. It was a debacle. 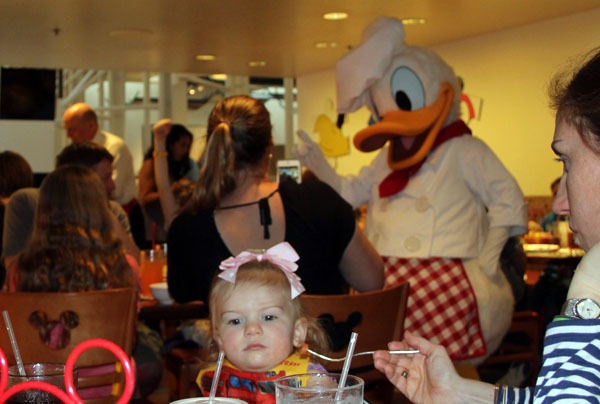 Tim had to wait for 20 minutes just to get the Chicken Parmisan at the make your own pasta station. The staff was either inept or understaffed. 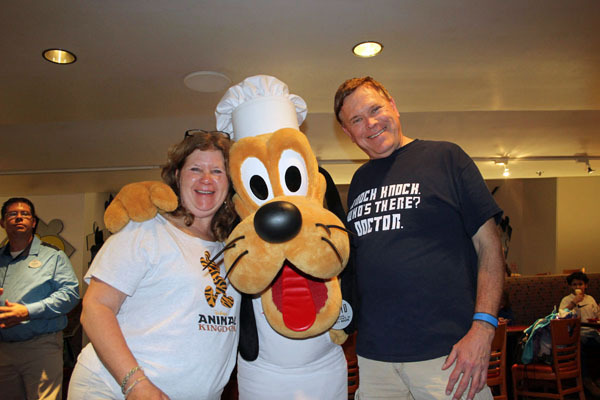 We wondered what this place is like when the resort is busy! We went back for dessert, a cookie and a red velvet whoopie pie, to eat back in the room. We have a very early race day and tried to get to bed early. Yes, we were up at 2:15 AM. Marissa strongly suggested that we get to the race early. The traffic and the crowds are enormous later on. She was right! We got the first bus out around 3 AM. It was a long walk to the staging area. 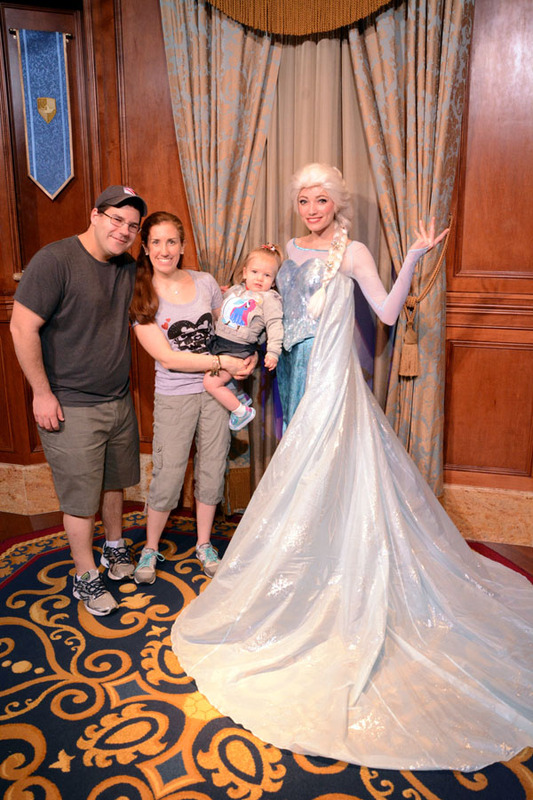 There was a DJ and opportunities to get pictures with a princess or two. Lines for them were already building. 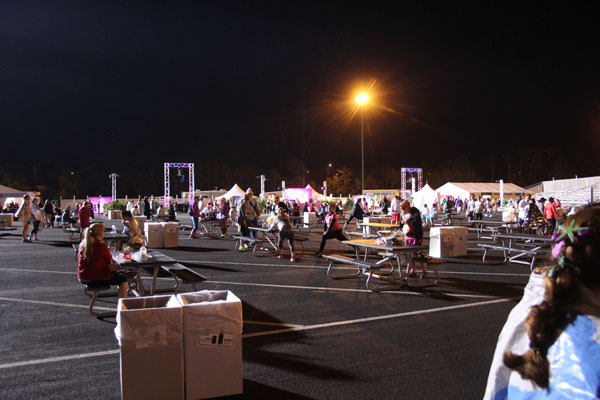 If you are a fast runner, lines are shorter after the race and before the masses get back from their run. 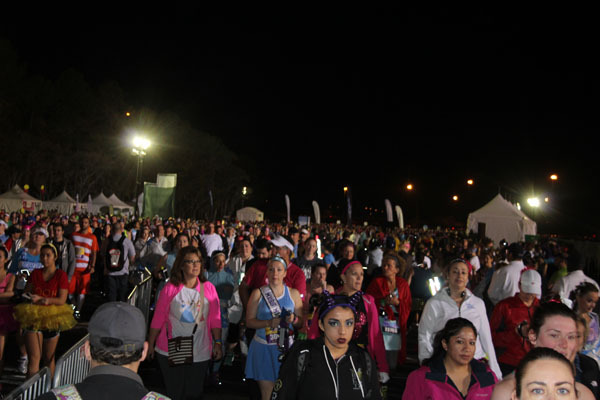 They called for the runners in the front corals to head to the starting line around 4:30. 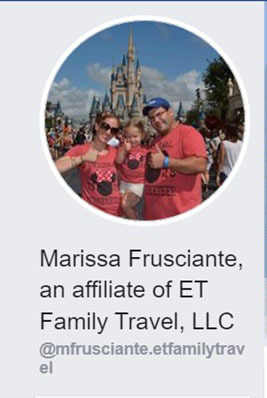 We wished Marissa good luck and made our way towards the monorail. Huge crowds were now pouring in. We stopped for a muffin and bagels from a food truck on our way. The race starts at 5:30 AM. 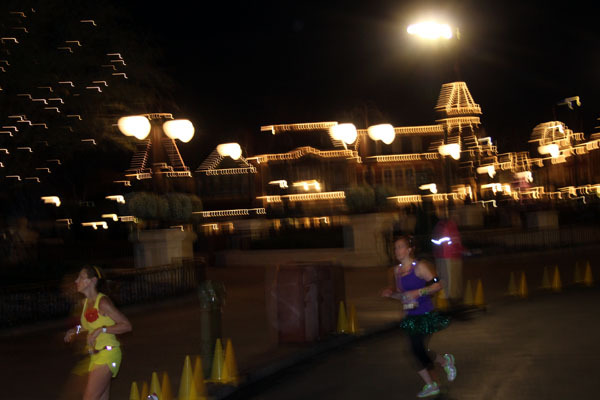 Marissa should be running through Cinderella’s Castle around 6:30. We switched monorails at the Ticket and Transportation Center (TTC) and headed into the Magic Kingdom. 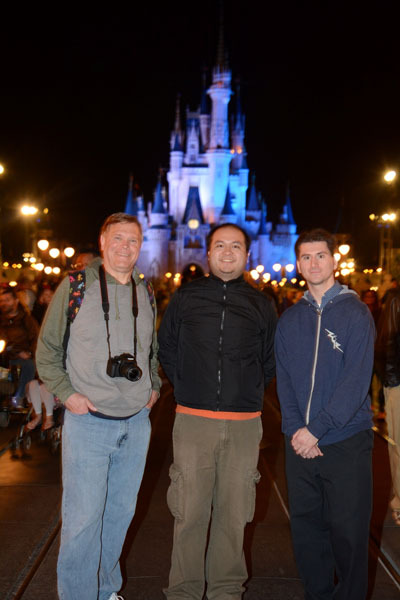 With the CHEAR squad Gold package wrist bands we were allowed into a reserved area right in front of the castle. 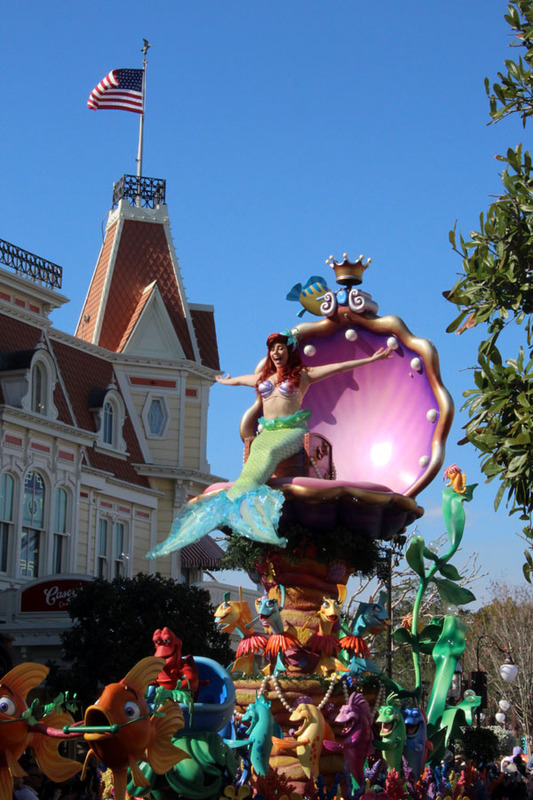 When she was near the park, I headed back to the circle to catch her after she runs up Main Street. It was still dark and my flash on my camera barely captured her. I ran to the reserve area and managed a dark picture of her at the castle. 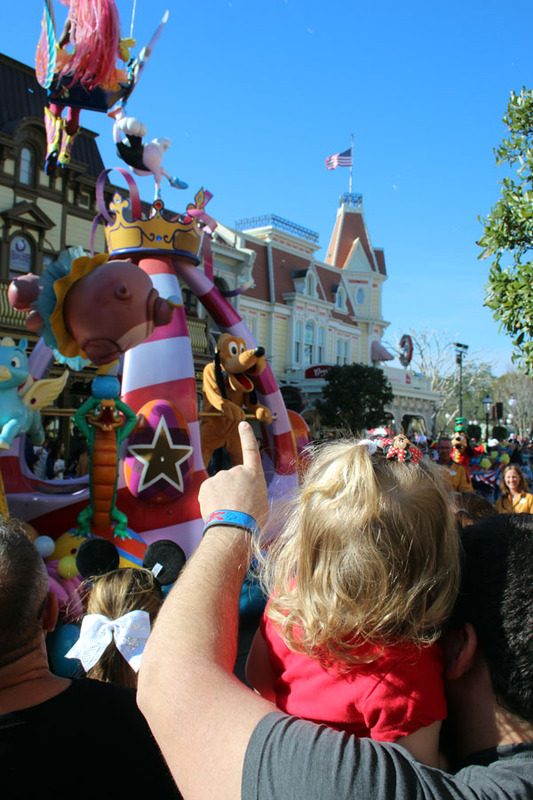 We made our way down Main Street. Racers, which were coming through one at a time were now in twos and threes. The sun was starting to come up. At the TCC we could see runners in a thin steady stream. 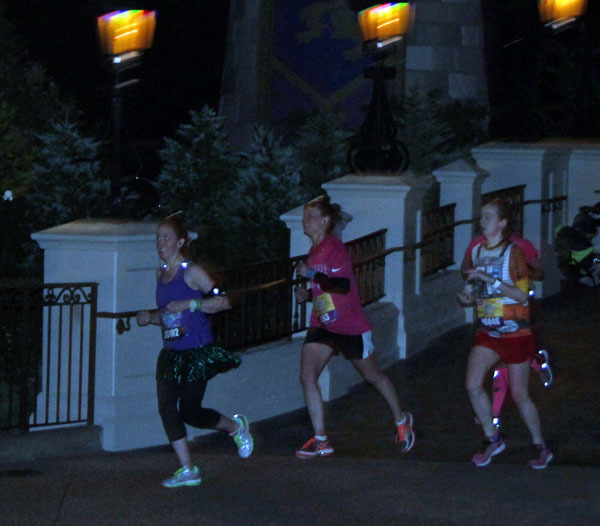 As we made our way to Epcot the stream of runners got wider and wider. 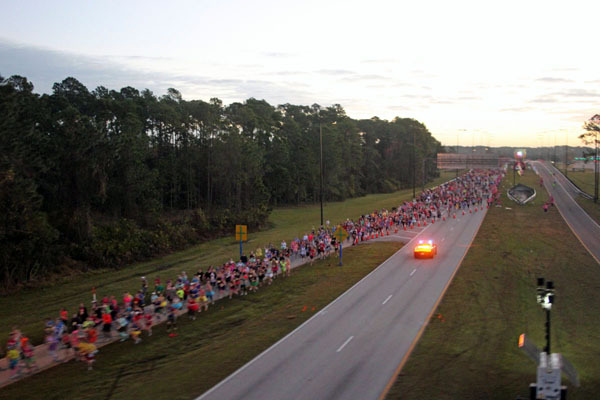 Near Epcot there was just a mass of runners streaming out. 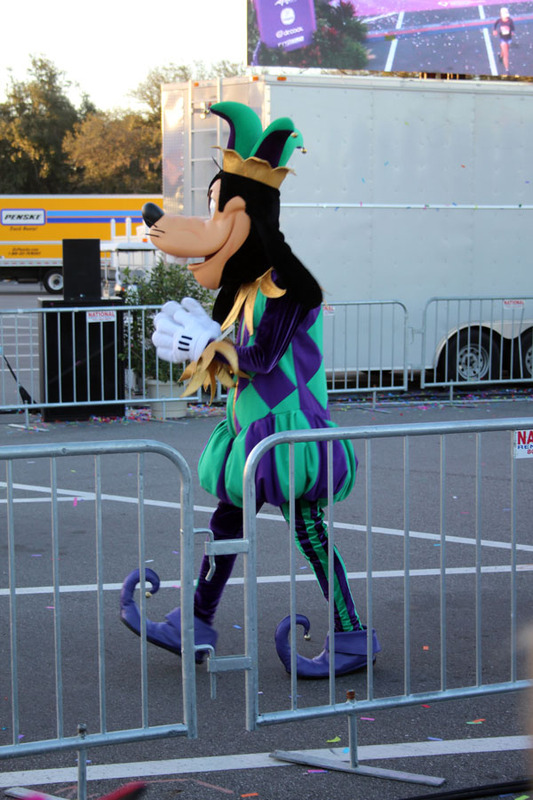 At the finish line Goofy and Donald were greeting runners. I missed photographing Marissa but Tim caught her on video. Her time was 1:53:25. Maddie and Tim greeted her on the side after the finish line. We then waited for her to exit the runner’s tent. They met her with roses. We headed back to the resort where we finished packing. We checked-in our luggage and got our boarding passes at the Resort Airline Check-in then stored our carry-ons with bell services. After breakfast we headed to the Magic Kingdom. 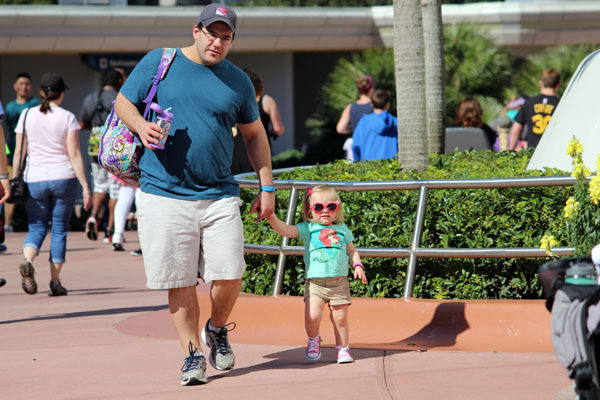 Tim and Marissa rode Space Mountain using fastpass as Maddie slept and we sat and people watched, soaking up our last Florida sunshine for a while. Next was a relaxing ride on the People Mover, followed by Buzz Light-year using fastpass. 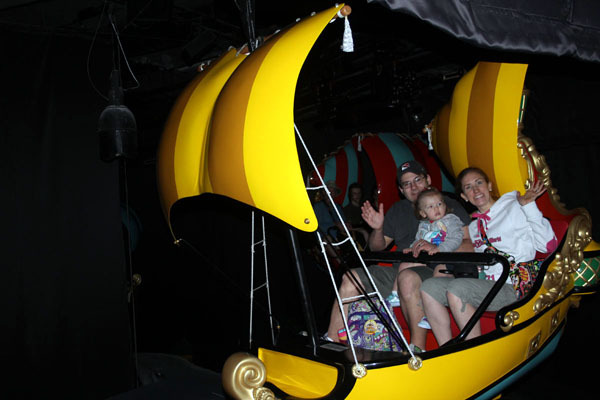 We then headed to Fantasyland for our last ride on it’s a small world. Maddie had the front seat of the boat with her parents and enjoyed the music. On our way out I quickly brought a Star Wars and Zootopia vinylmations while Tim, Marissa and Maddie took some pictures in front of the park. We left the park at 12.45. It was a quick lunch to make sure we had time to retrieve our carry-ons and be at the DME bus stop at 2:15. 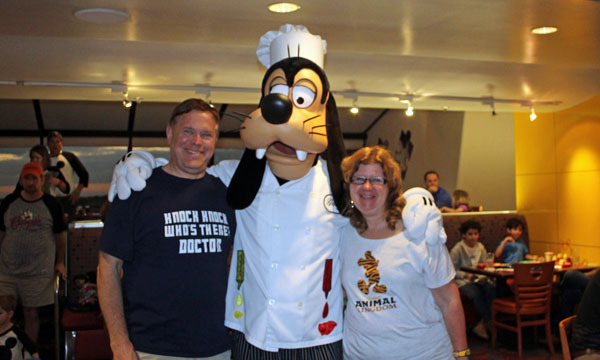 We shopped in the Disney and Universal stores at the airport. We had difficulty with the JetBlue employees at the gate. They did not know their own rules about carry-on luggage and Tim and Marissa had a hard time with them. JetBlue did not want Maddie's baby bags on with her. We finally got on the plane and had an uneventful fight back. I went to work Monday. 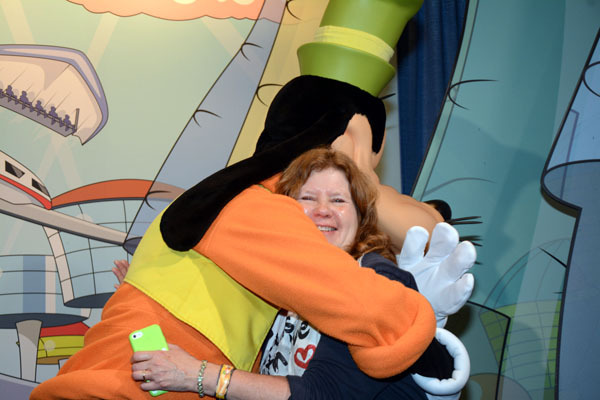 On Tuesday, I was back on a plane to Orlando to attend a Smart Coatings Conference for work. I upgraded to more legroom and had a row all to myself! 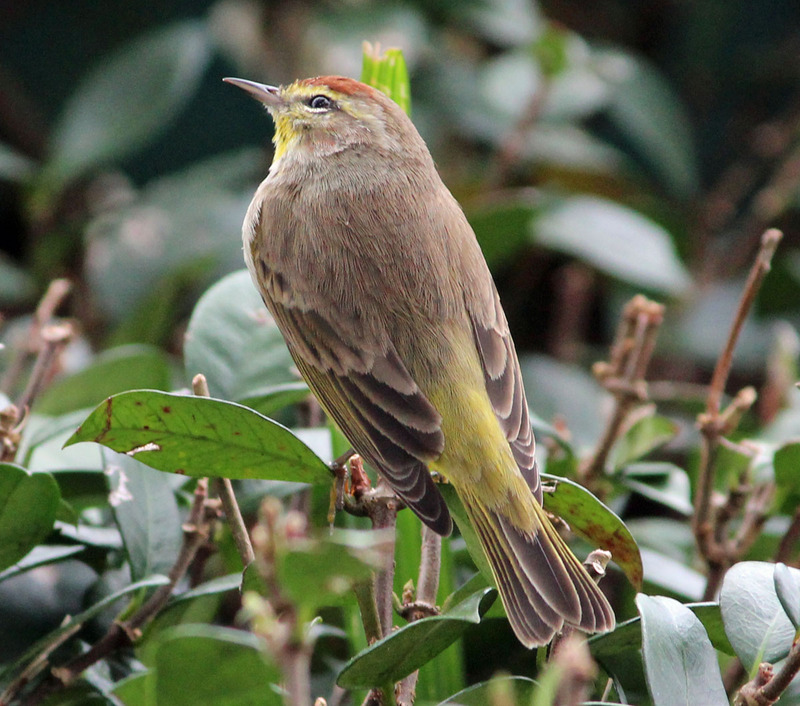 The early morning flight left me time to do some bird watching and shopping before checking into the hotel. 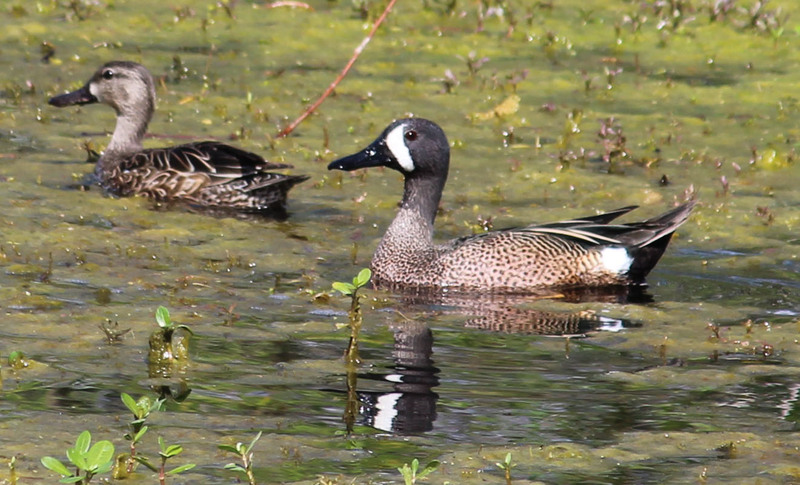 I headed from the airport to a favorite place; the north end of Lake Tohopekaliga on Neptune Road in Kissimmee. 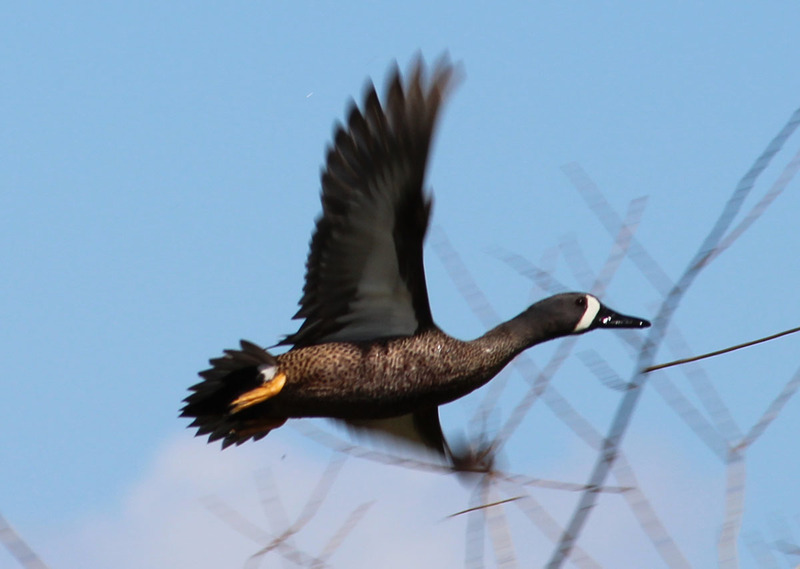 It was warm but very breezy as a White Pelican flew by. The trees near the lake held Black-and White, Palm and Yellow-rumped Warblers. 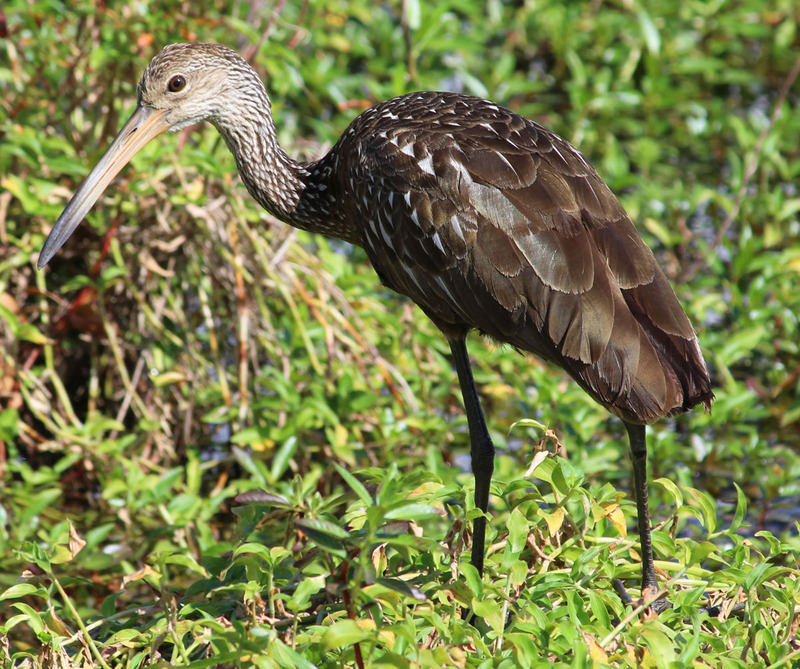 On the north side of Neptune I found Blue-winged Teals, Limpkins, coots, gallinules, herons and an Eastern Phoebe. I checked into my hotel, the Hilton Garden Inn about a mile from Disney Springs. 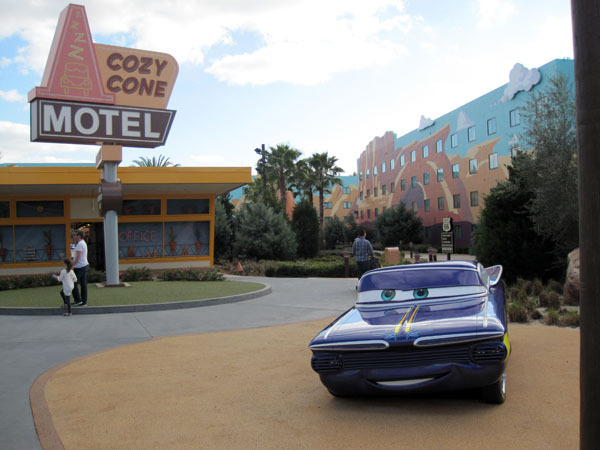 After checking out the room I drove over to Hollywood Studios and parked, then took the boat over to Epcot. 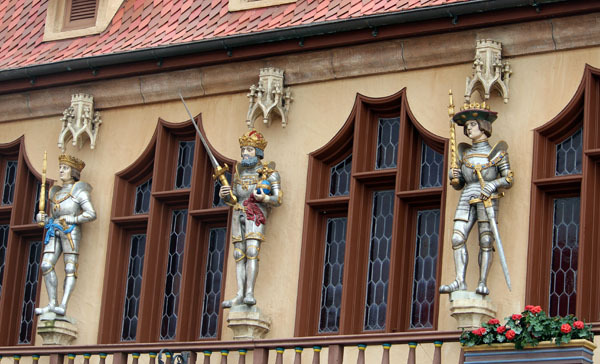 I walked the World Showcase, mainly to do some photography and eat. I snacked on a sponge cake in the UK, munched on Eggrolls in China, ate the kids shrimp meal in America and had some good sushi in Japan while relaxing at the top of their water feature of stream, ponds and waterfalls. I was disappointed in the eggrolls. They are much better back in NY. 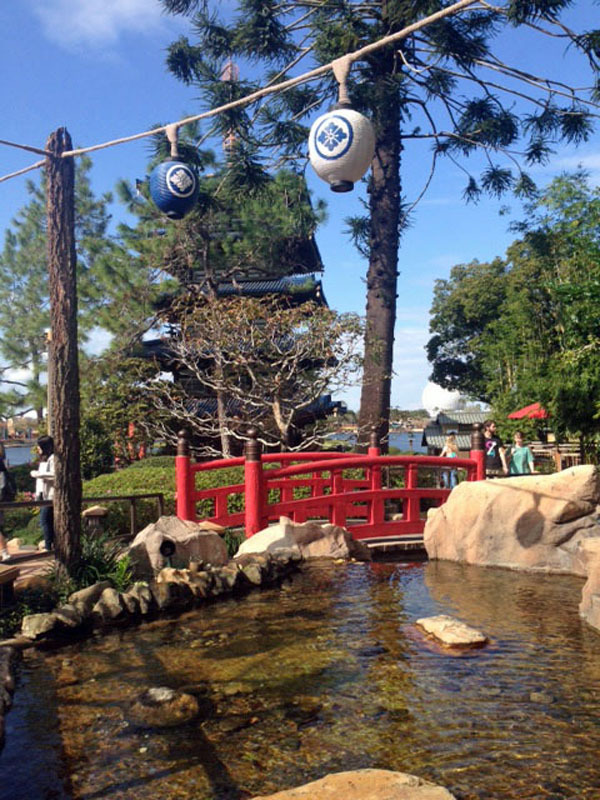 I took the boat across World Showcase Lagoon from Morocco to the Showcase Plaza, then shopped in Mouse Gears. Outside I saw that some Purple Martins had returned to their nest boxes. 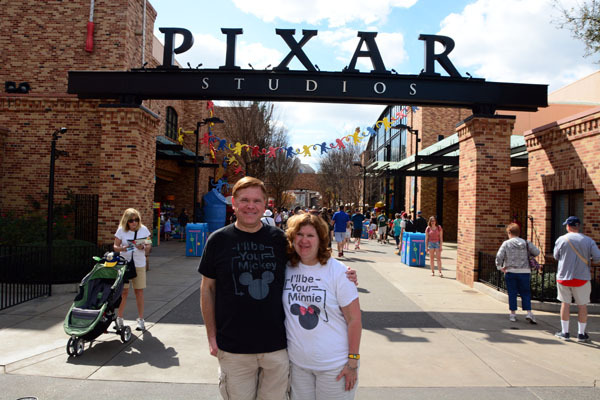 I headed over to the Imagination Pavilion and saw the new Disney & Pixar Short Film Festival. The first “Get a Horse” starts out as the classic black and white film, but enters the 3D and 4D world for some unexpected fun. The second was the cute “La Luna”. The third was “For the Birds” and is one of my favorite Pixar shorts. These are even more enjoyable in 3D. Do not miss this if you have the time. 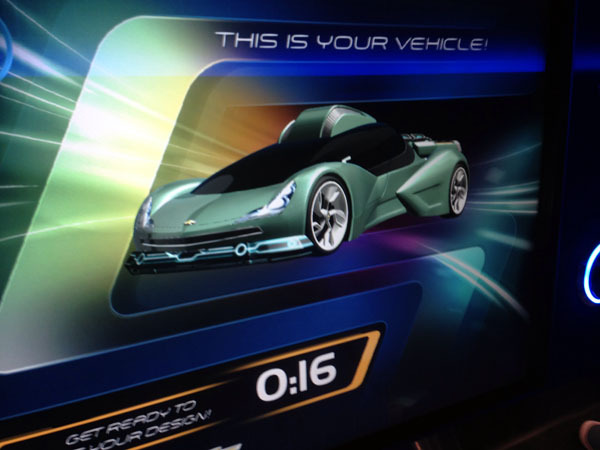 I headed over to Innoventions East to experience Colortopia. This look into color and paint sponsored by Glidden was of interest to me since I work for the rival Benjamin Moore. 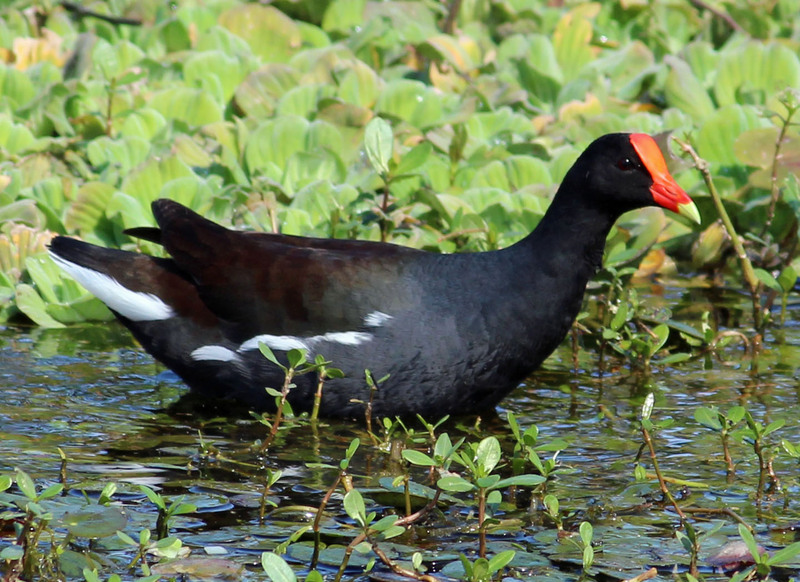 The science behind color was presented in three areas and did a good job. The interactive parts were fun. The free associated app can be useful as well. It was time for dinner and I splurged by heading to Monsieur Paul located upstairs in the France pavilion. This expensive restaurant doesn’t take any discounts such as the Tables in Wonderland. I was not as hungry as I would have liked so I had a beer and two appetizers. 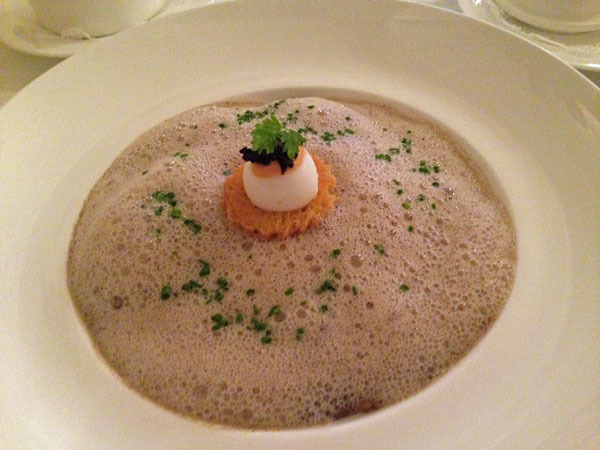 I had the Cassolette d’escargots (Escargot Cassolette with white wine, bacon, shallots) and the Homard du forestier (Maine Lobster with Sautéed Mushrooms with mollet quail egg and creamy black truffle bouillon). 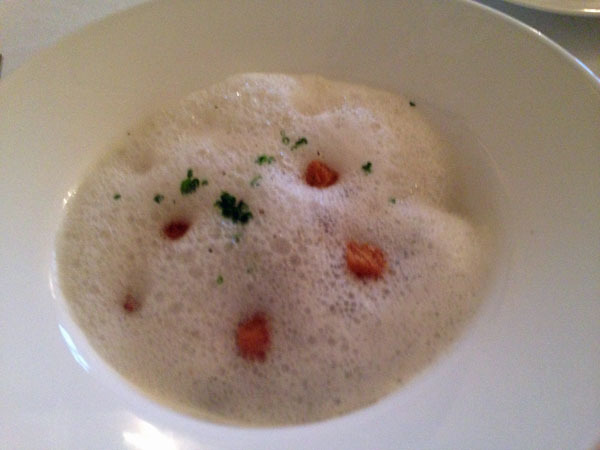 Both were great, but very rich and the portions generous. I could not finish it all. With tip the bill was $65; glad I skipped the entrees and just had the two appetizers. 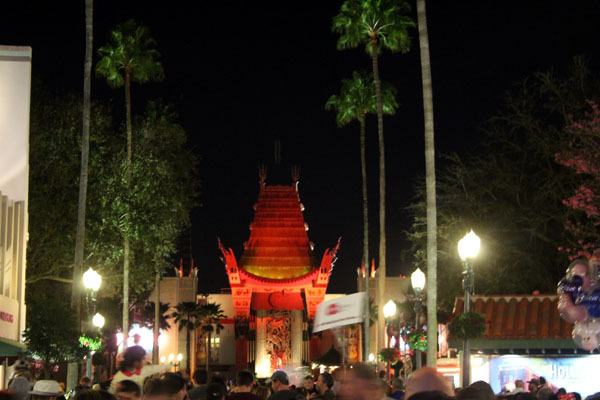 I exited Epcot through the international gateway and a boat to Hollywood Studios was just about to pull in. 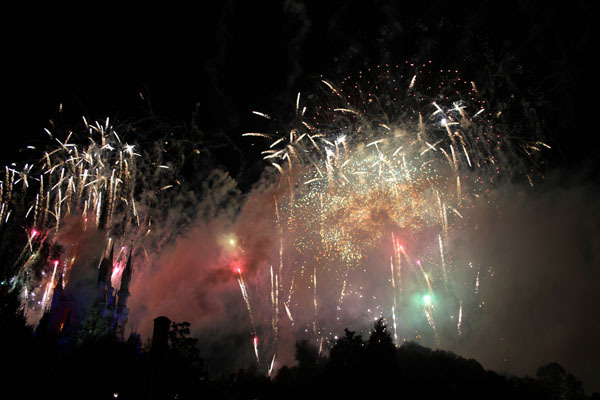 At Hollywood Studios I positioned myself on Hollywood Blvd and saw the Star Wars themed fireworks, Symphony in the Stars: A Galactic Spectacular. I headed straight out back to the car and hotel for two and a half days of very interesting talks on Smart Coatings. During lunch I went over to the nearby Character Warehouse to shop. 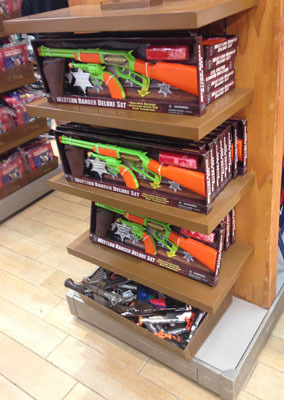 The big thing I noticed was all the toy guns taken out of all the shops in Walt Disney World were now on sale here. 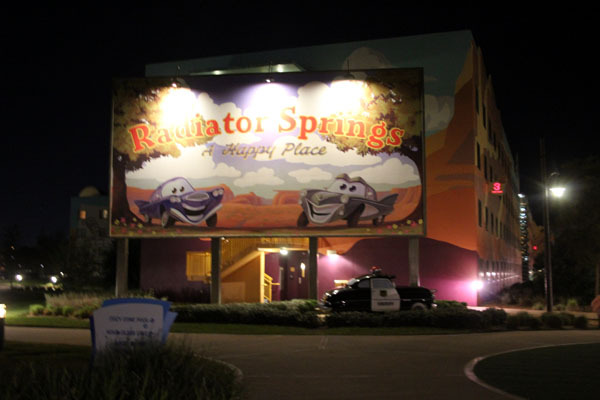 In the evening I took my two coworkers, Nick and Kevin, to Disney Springs for dinner at Ragland Road. We parked in the garage and walked over. They were surprised that Disney provides so much free entertainment with the variety of bands and musicians playing here. After dinner we walked around, grabbed our free chocolate in Ghirardellis, and I shopped for some presents for Kelli back home. 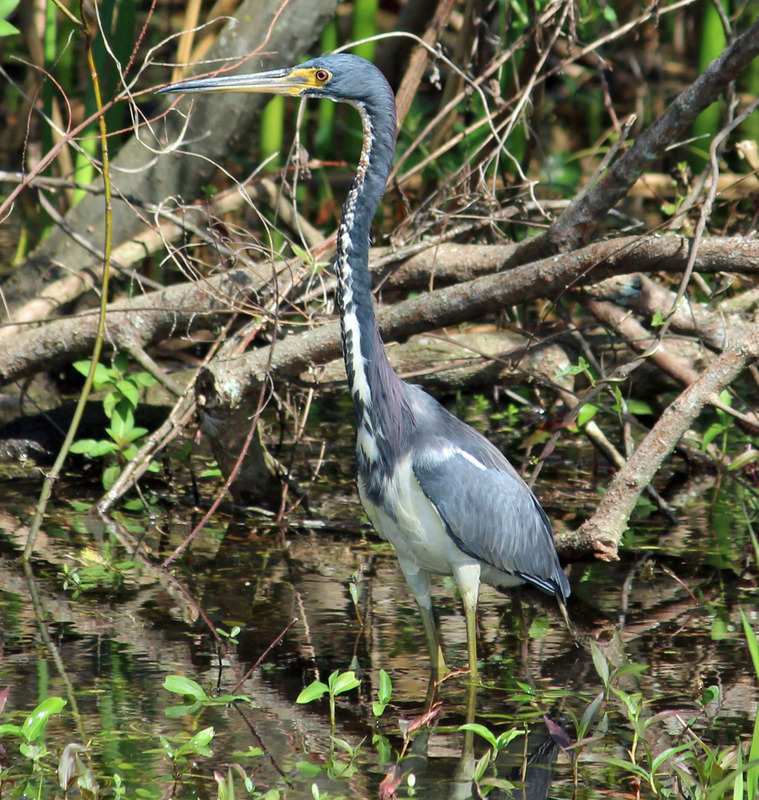 We discovered over two dozen Great Egrets using the boons in the water for construction as night time roosts. 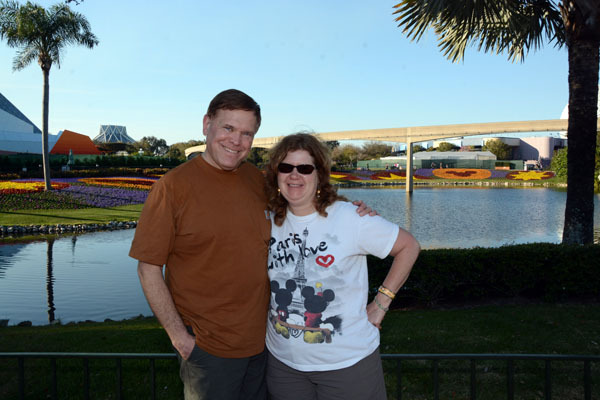 Kelli and I own DVC at Saratoga Springs. 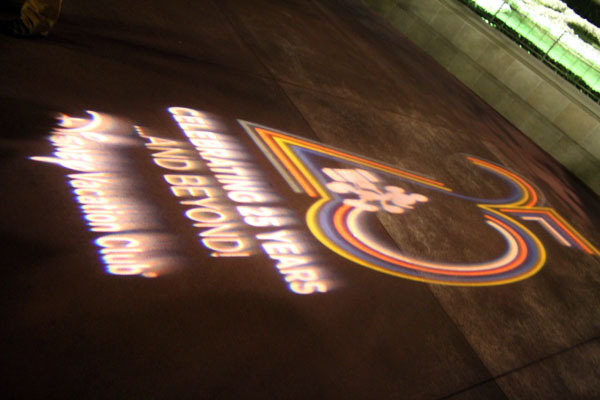 Prior to heading down for the conference we were informed of a free “25 and Beyond Bash” event for DVC members at the Magic Kingdom tonight. 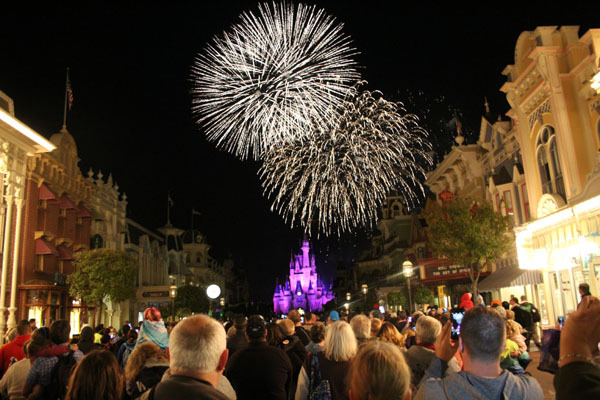 I could bring up to five guests for an after party where half of the Magic Kingdom would stay open an extra two and a half hour after closing to the public. I quickly found out who else from my company was heading down and signed them up. The evening started with a great dinner at Kona at the Polynesian Resort. We then took the monorail over and got our wristbands for the evening. We were there early enough to see the last half of the Celebrate the Magic castle show at the foot of Main Street. This was followed by Wishes. The regular park was still open so we headed to Pirates of the Caribbean with a 30 minute wait. We made it to Big Thunder Mountain Railroad just before it closed for the night. The Haunted Mansion was open for the event so we headed towards it. 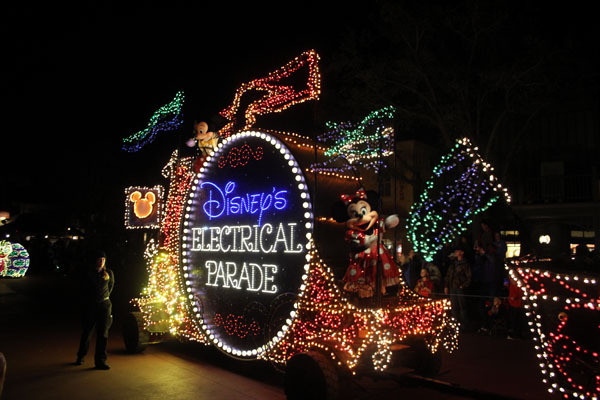 It looked like the park was setting up for a parade so we waited and got to see the Electric Parade with no crowds. 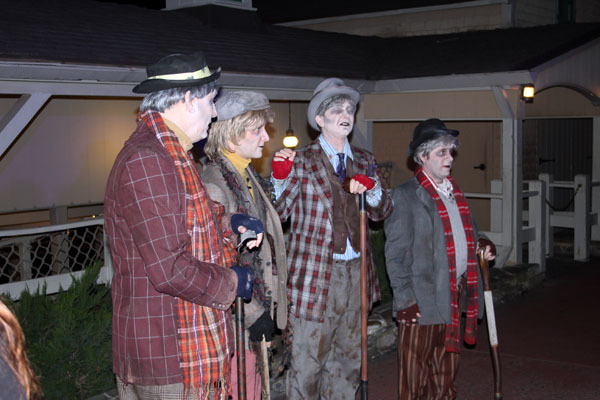 Outside the Haunted Mansion there was a haunted singing quartet. The line for the ride was long but we waited. Disney did not skimp on the Bash. They had the fog machines on and did the full stretching room preshow. 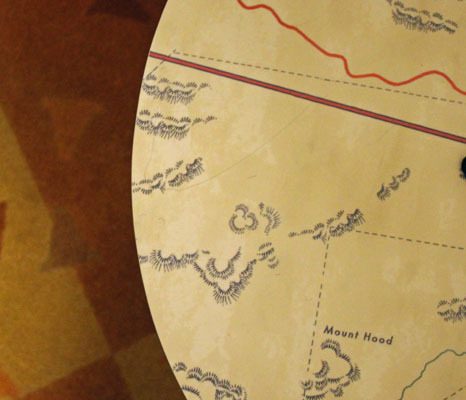 In Fantasyland they had free refreshments out consisting of water, lemonade and cookies. We rode Buzz-lightyear then crossed over to ride Space Mountain. The bash had a dance party going on in Tomorrowland featuring Mickey and Goofy. We grabbed more free refreshments then watched a special 25 year DVC anniversary fireworks show from the Tomorrowland Bridge and called it a night. My brain was now fried listening to so many highly technical but great talks. The conference ended at noon and I had a late flight out. 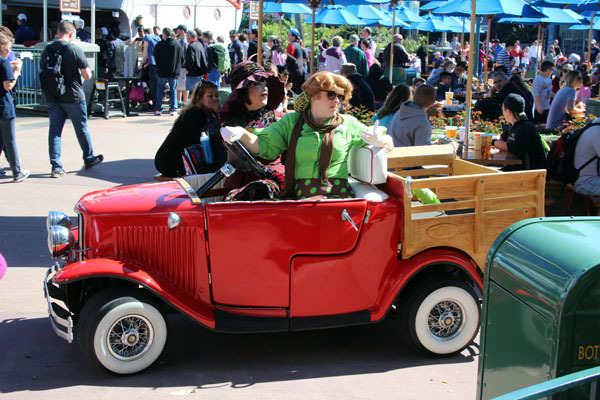 I stopped at Disney Springs for lunch visiting the food truck area. 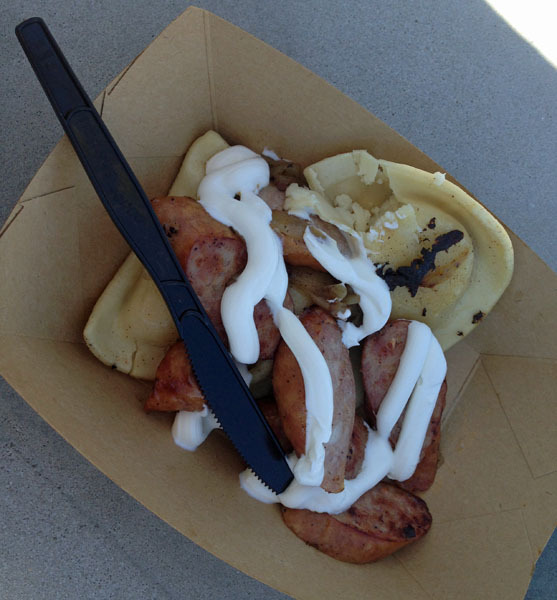 Only two were open so I opted for the Pierogies – with Kielbasa and Caramelized Onions in the World Showcase of Flavors truck. 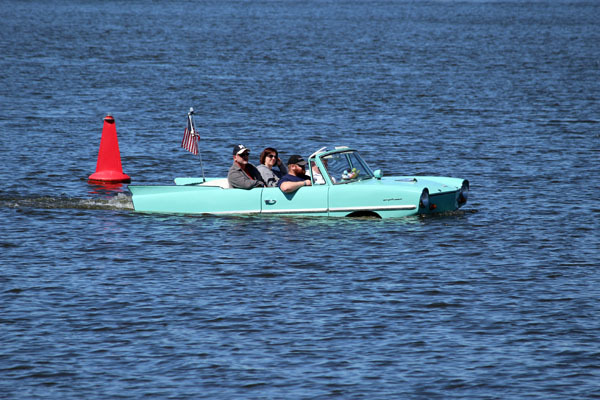 I saw a couple of the Amphicars out on the lake and there were a few female Boat-tailed Grackles looking for a free handout or dropped food. 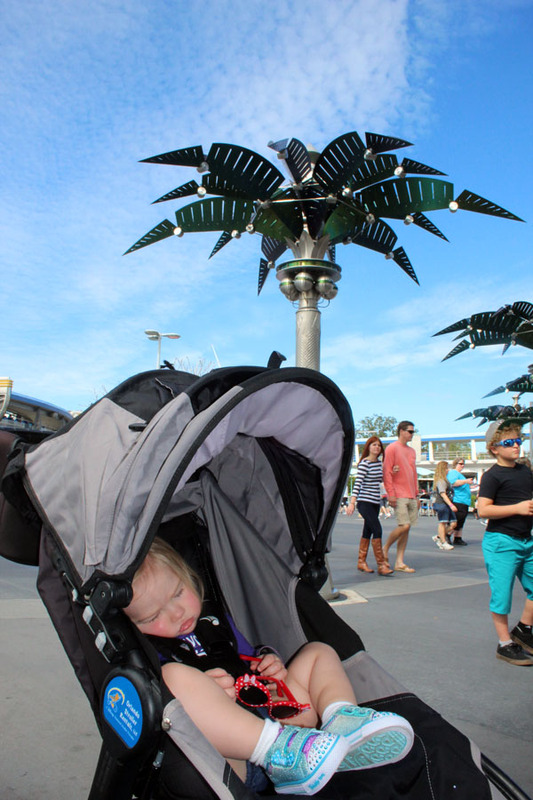 I had three fastpasses set up for Hollywood Studios for the afternoon. First was Tower of Terror with a very screamy group. That always adds to the fun. I briefly stopped at two sets of street performers. 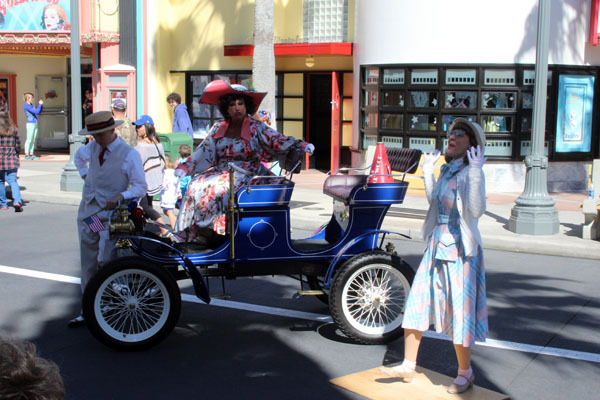 The Citizens of Hollywood troupe was making up humorous songs based on the state guests were from. Next was Star Tours and I got my favorite scene, the underwater one where a sea creature tries to eat the StarSpeeder. My last ride was Toy Story mania and I scored well, but just missed 200K with a score of 199,500! Argh! I left the park, gassed up at the Speedway just outside the park. I then stopped for dinner back at the food trucks. 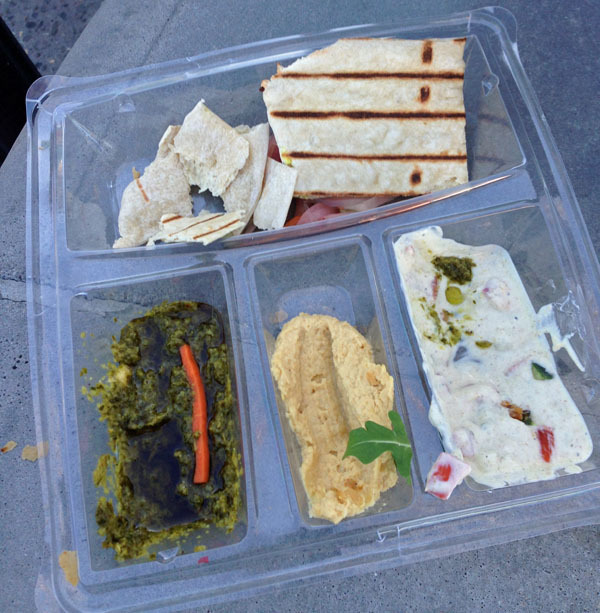 All four were open and I wanted to try the Samosas and Naan Dipping Safari from Namaste Café. I hit some Friday afternoon traffic trying to get to the highway back to the airport. I was running late and had yet to check in. I tried the kiosks and it would not let me, and the lines to check in were very long. I was afraid I would miss my plane. When I checked-in I found my flight had an hour and half delay due to high winds in New York. This turned out to be a blessing. Security was a mess and took forever, I would have missed my original flight time. We finally left the gate at 8:45 and landed at 11:20PM. My limo driver was great. He said met him at departures, which was empty at this time of the night. As we left the airport I could see the traffic going into arrival was horrendous. I was home before midnight!